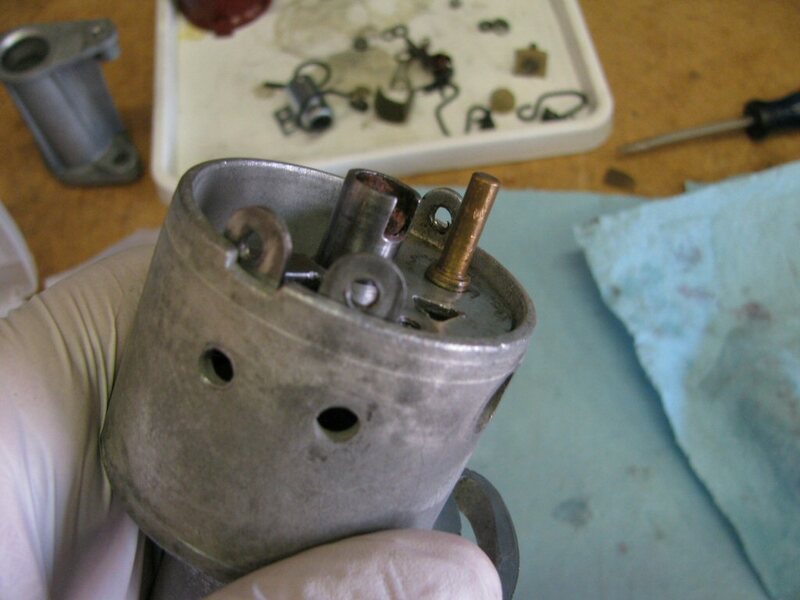 The complete distributor, removed from the engine case. 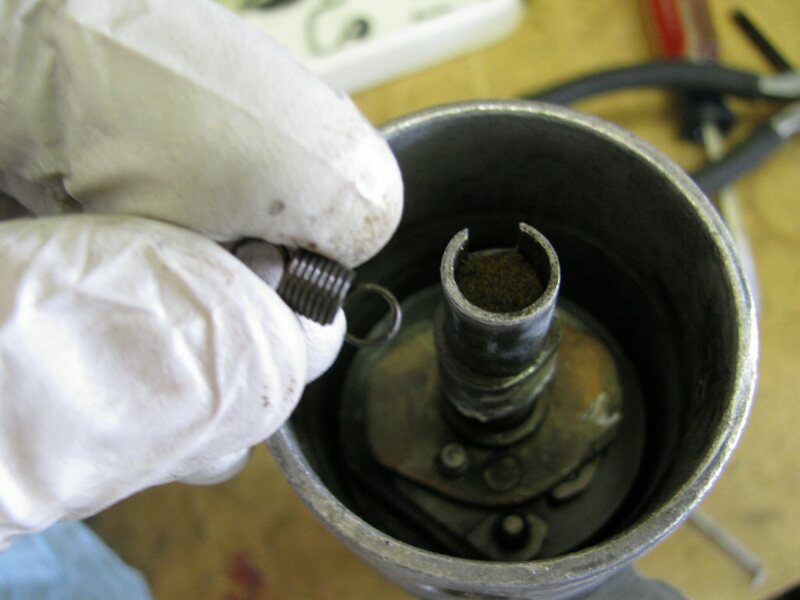 Remove the bolt that secures the body of the distributor to the distributor base. 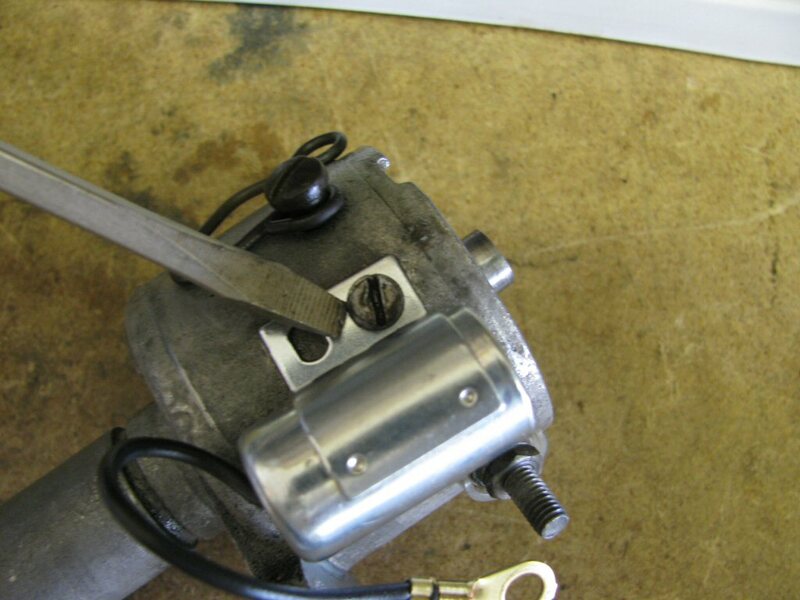 This distributor has had a special washer fabricated to spread out the tightening force and prevent indentation into the softer aluminum of the distributor body. Nice. Slide the distributor base off of the distributor body. 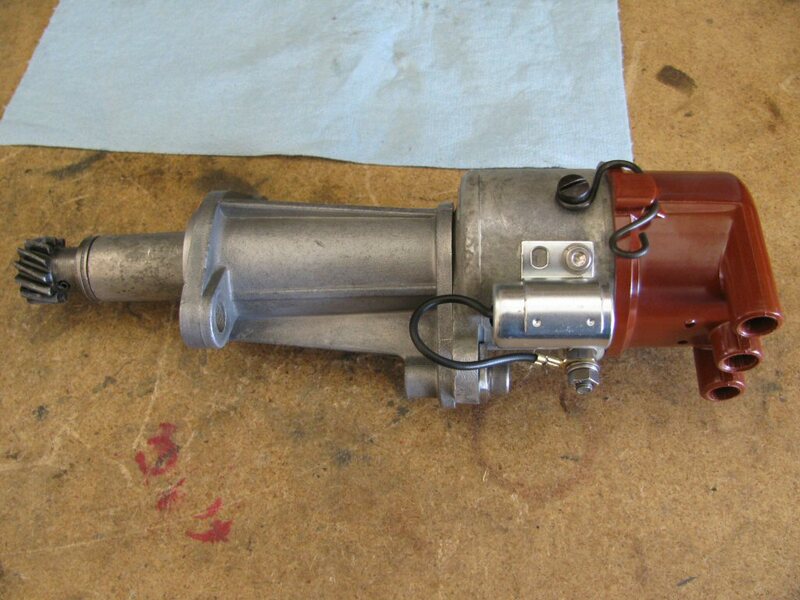 The distributor body with the base completely removed. 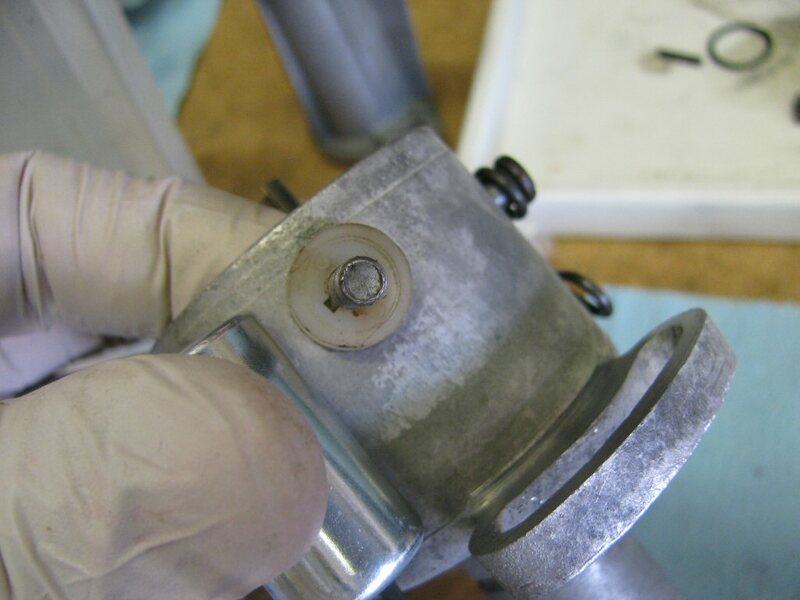 Remove the nut that secures the wire terminal from the condenser. 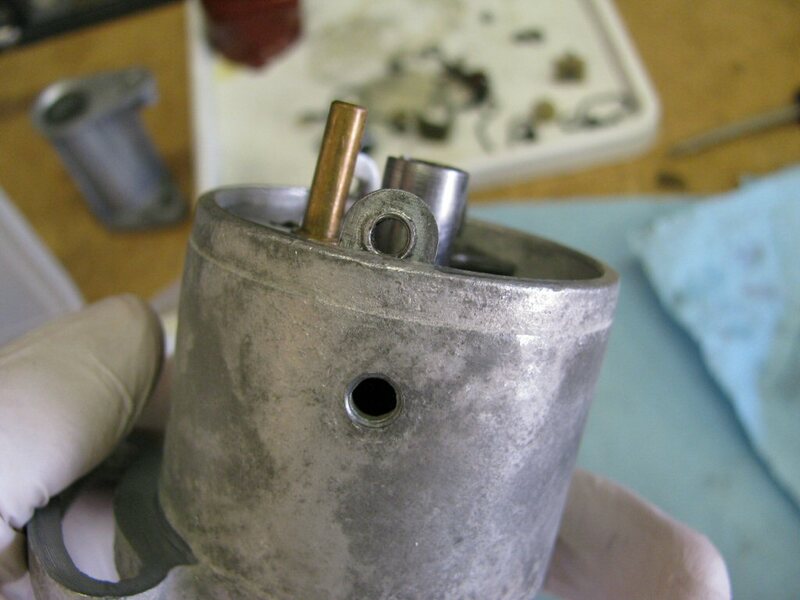 Remove the screw that secures the condenser to the distributor body. 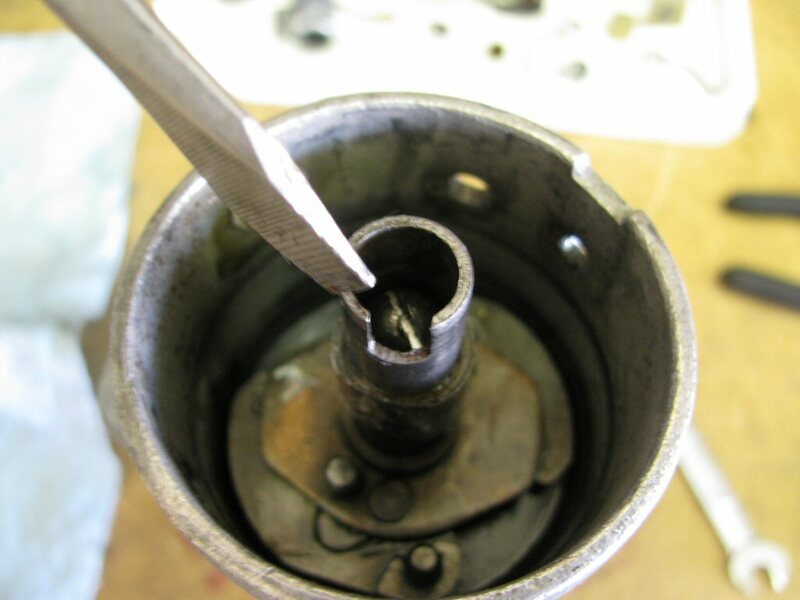 Remove the screw that secures the points in place. 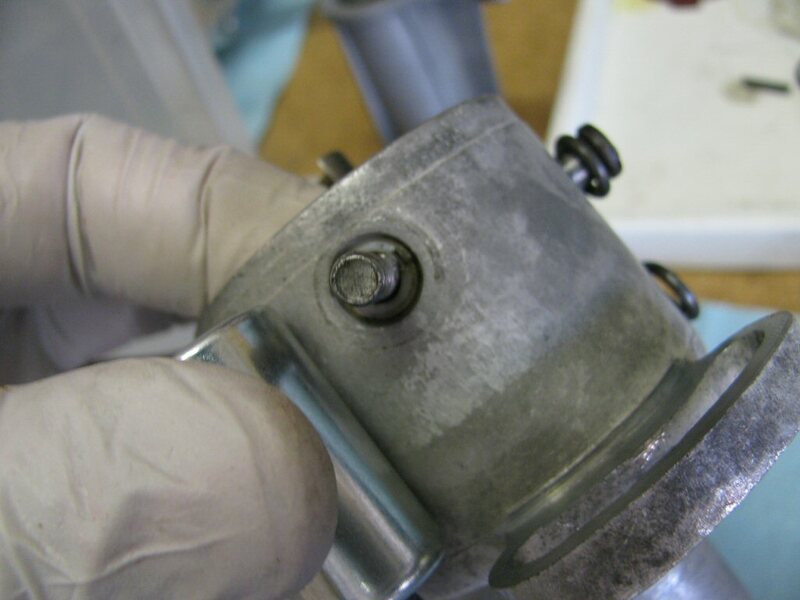 Remove the nut that secures the metal strap from the points. 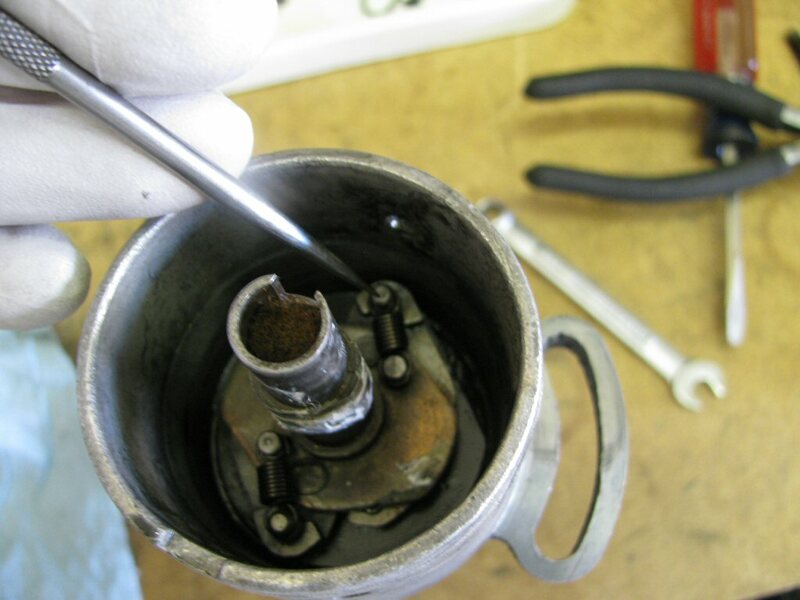 Remove the plastic insulator from the outside. Remove the points (both pieces). 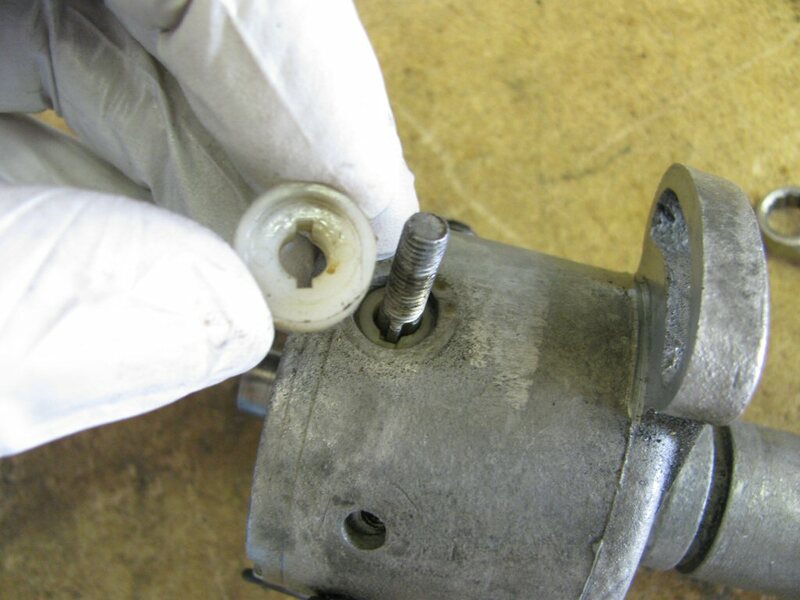 Remove the bolt from the inside along with the plastic insulator. Note that the hole in the plastic insulator is not centered (top to bottom). The hole is closer to the bottom. If you flip it around, it will not fit properly. 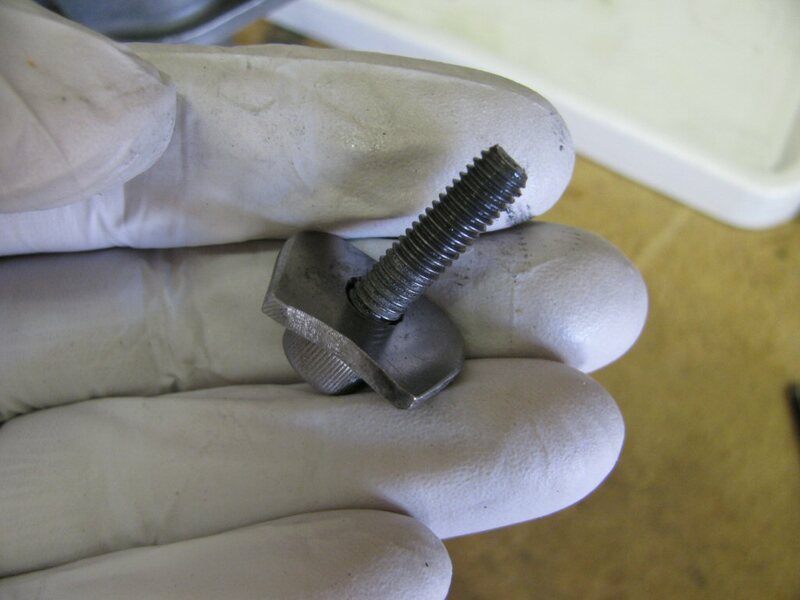 Also note that the bolt is shaped such that it will fit the insulator in a keyed fashion. 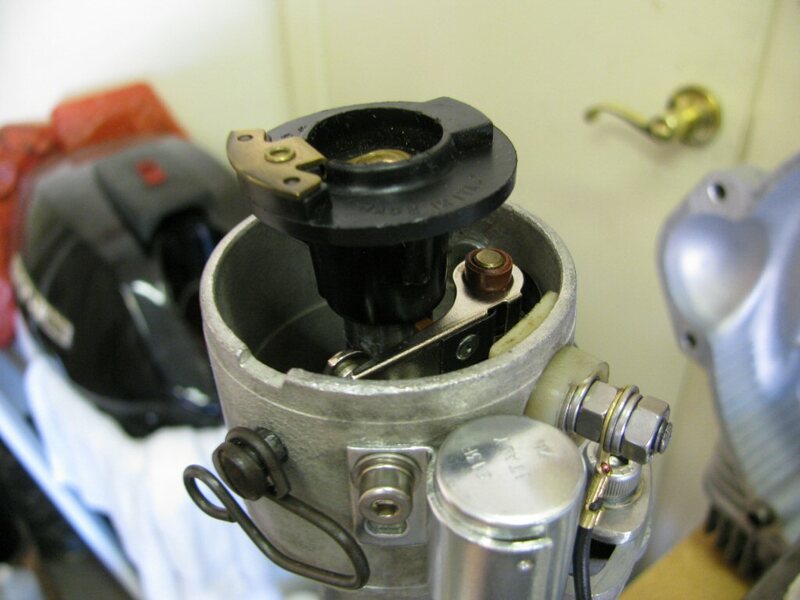 Remove the shoulder bolt and the spring clip that holds the distributor cap in place. 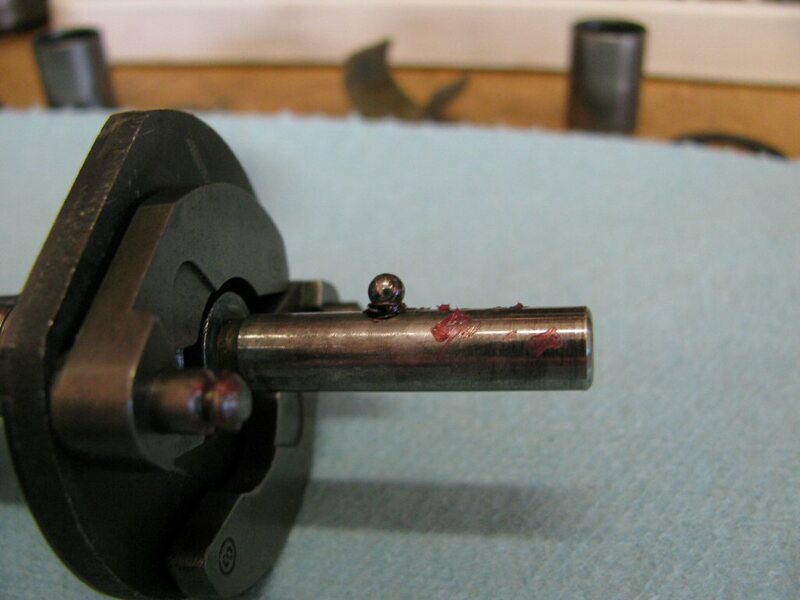 Just another photo of the other shoulder bolt and spring clip. 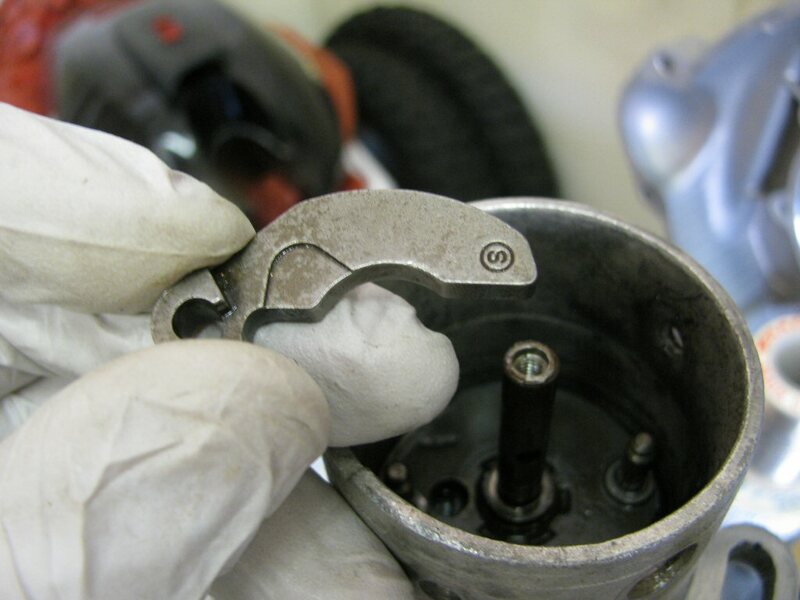 Using a needle nosed pliers, remove the plate as shown. DO NOT GRAB THE POST ON WHICH THE POINTS PIVOT! Doing so will scar the pivot and the points will not pivot smoothly. Wiggle it back and forth until the plate is free. 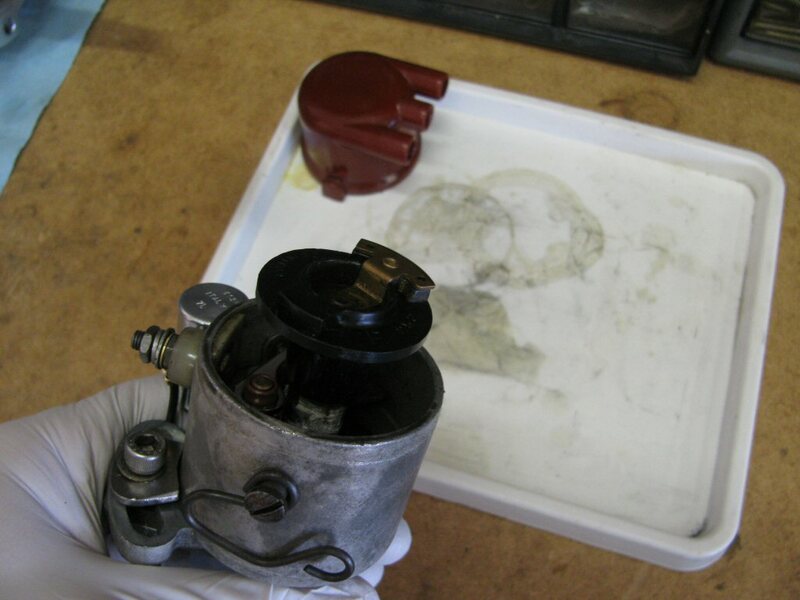 Here is what it looks like with the plate removed. Here is one advance spring. Here is the other advance spring. Remove it. 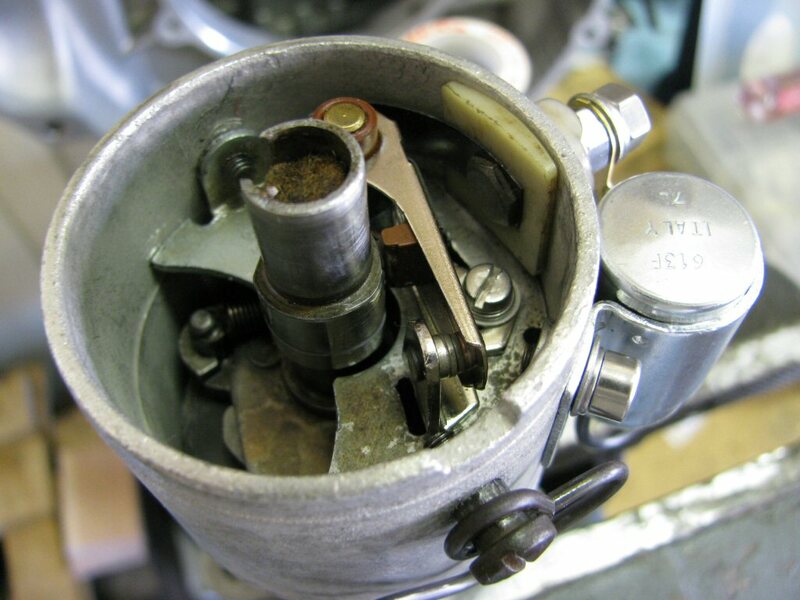 Please note that this distributor was set up to use two of the shorter, eight coil advance springs. 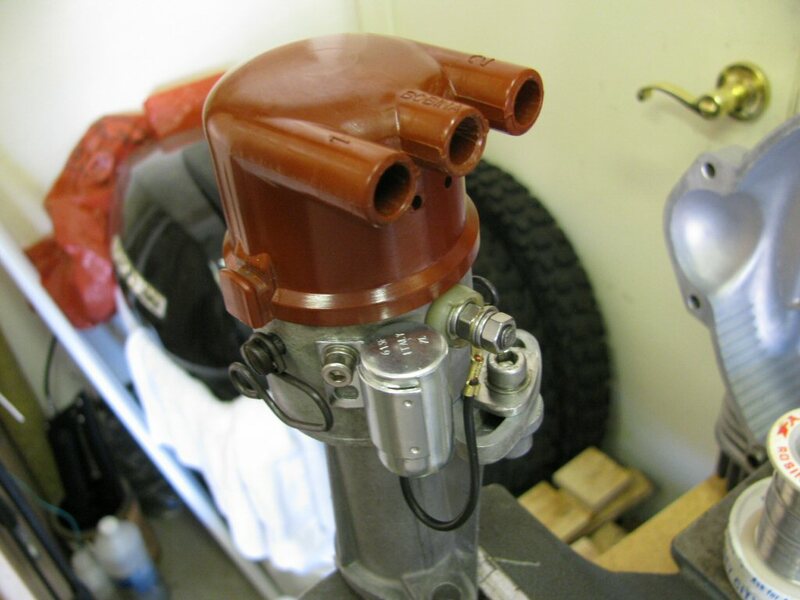 Mark Etheridge of Moto Guzzi Classics likes this modification. 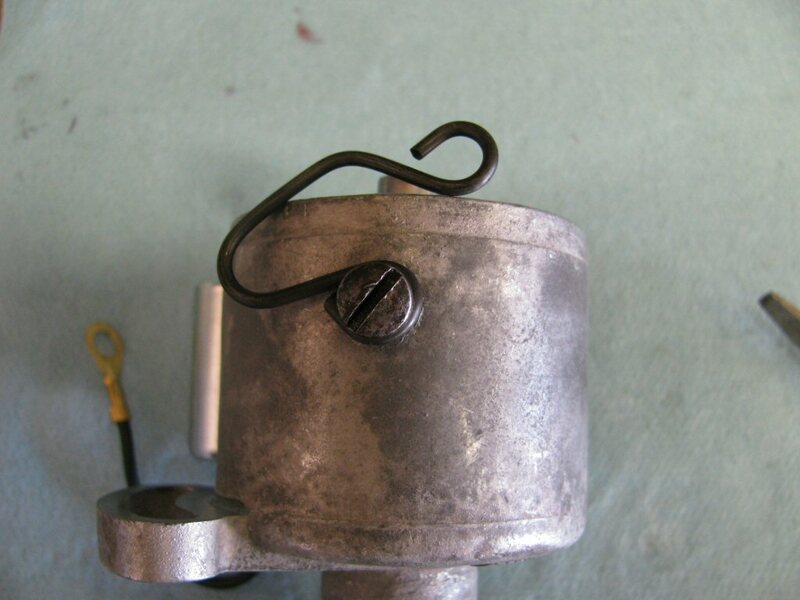 From the factory, one shorter eight coil spring and one longer nine coil spring were used. 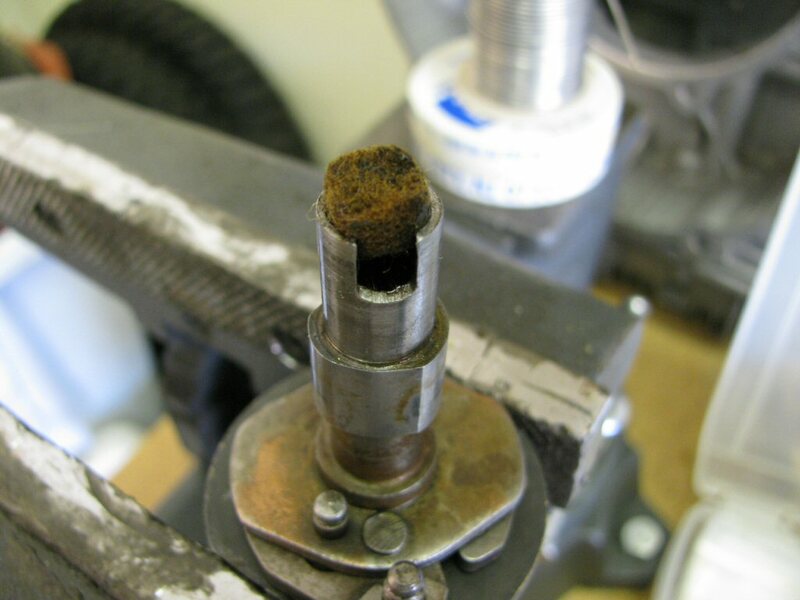 Here is the little felt plug that covers a screw. Remove the little felt plug. 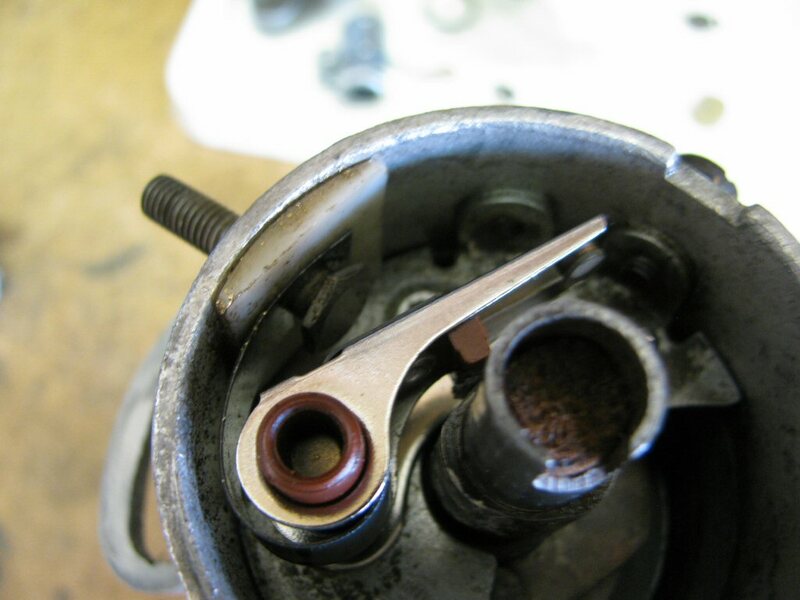 Secure the bottom gear in a vice. 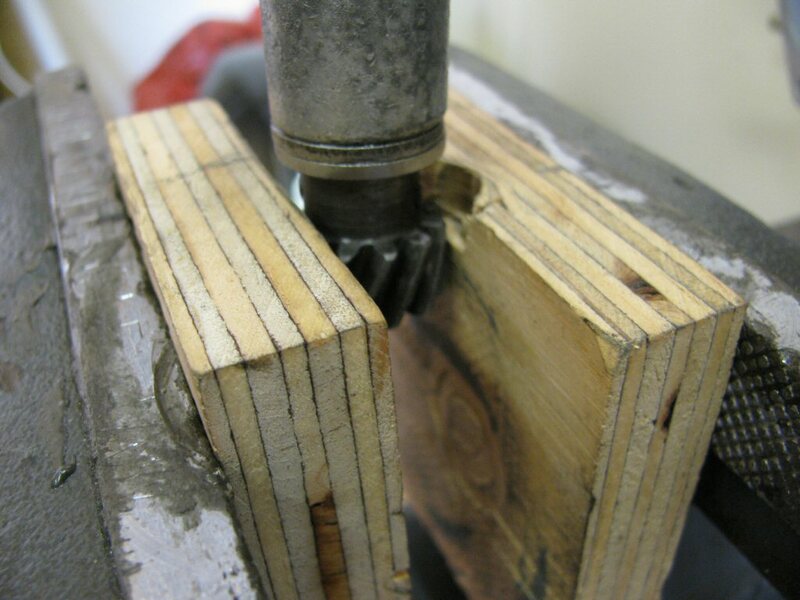 Protect the gears with blocks of wood or similar. 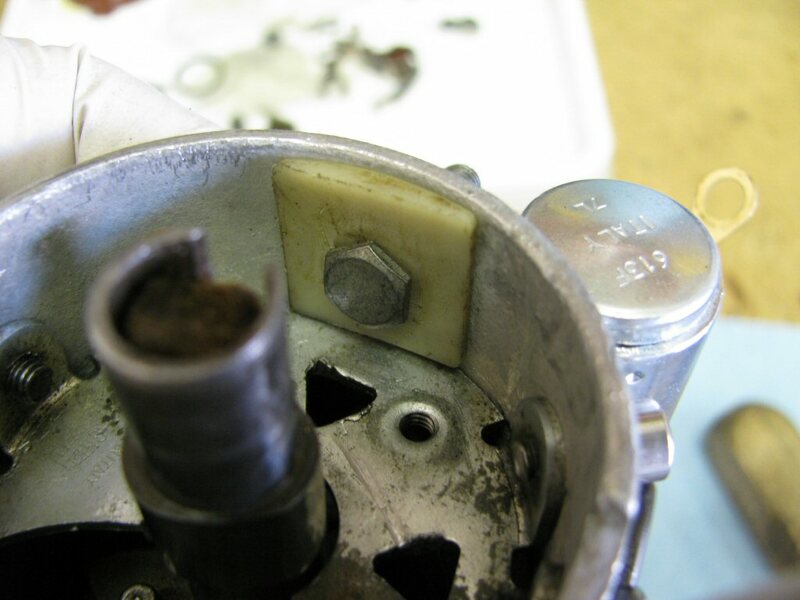 Remove the screw that was exposed when you removed the little felt plug. 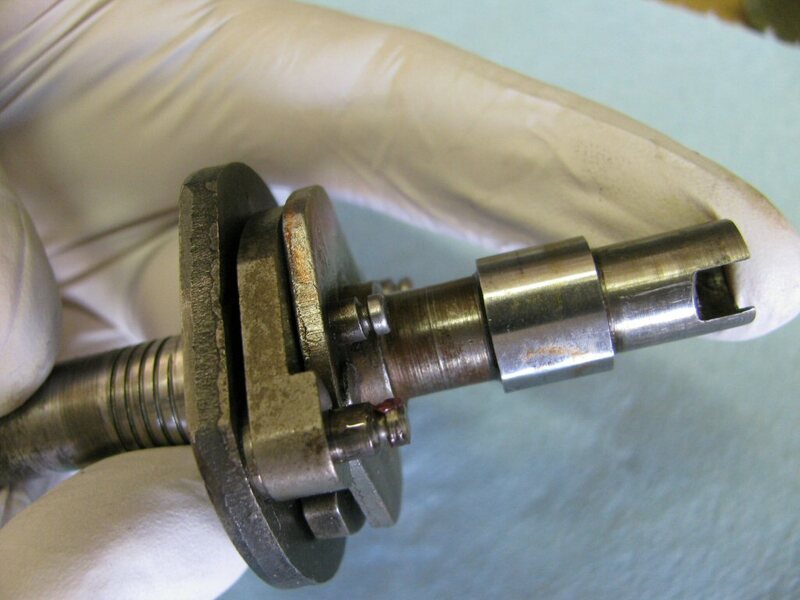 Here is the removed screw. 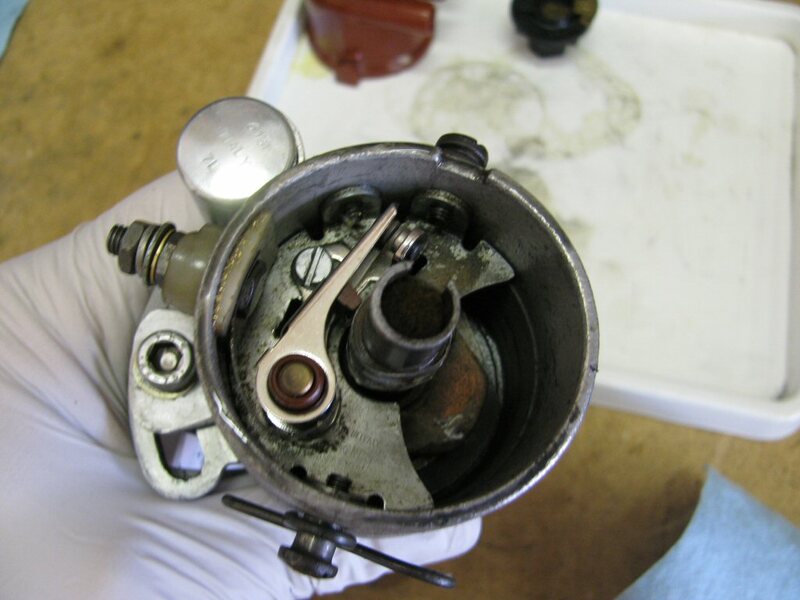 Remove the advance mechanism. 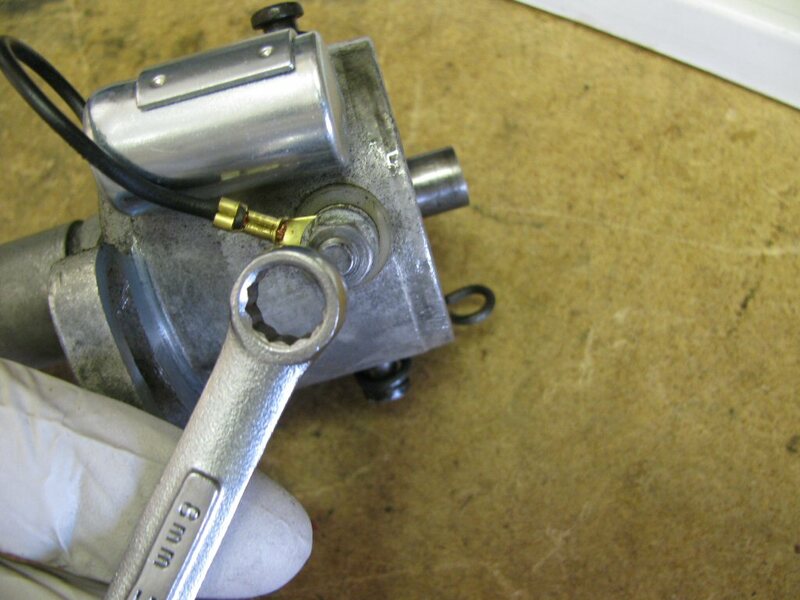 When you pull it up, a small ball bearing and the spring behind the ball bearing will fall out. Be careful not to loose these tiny pieces. 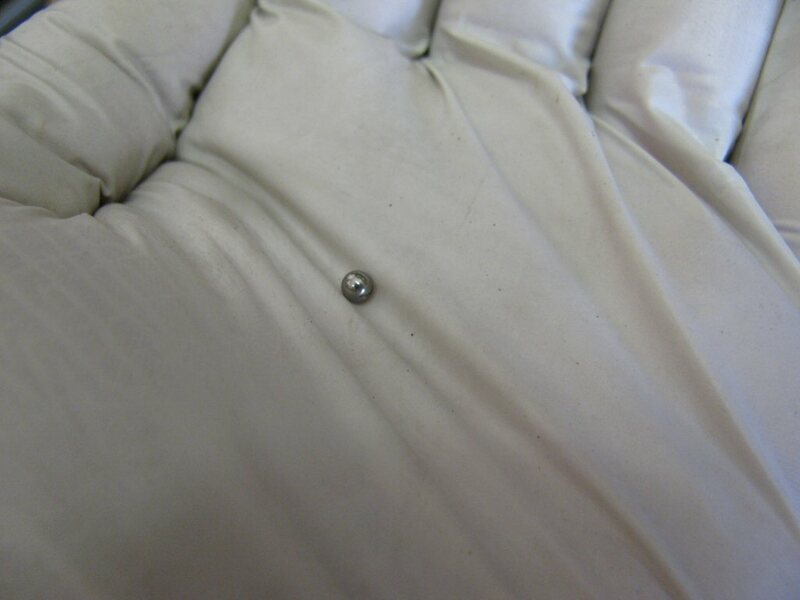 Here is the tiny ball bearing. The spring remained in the hole. 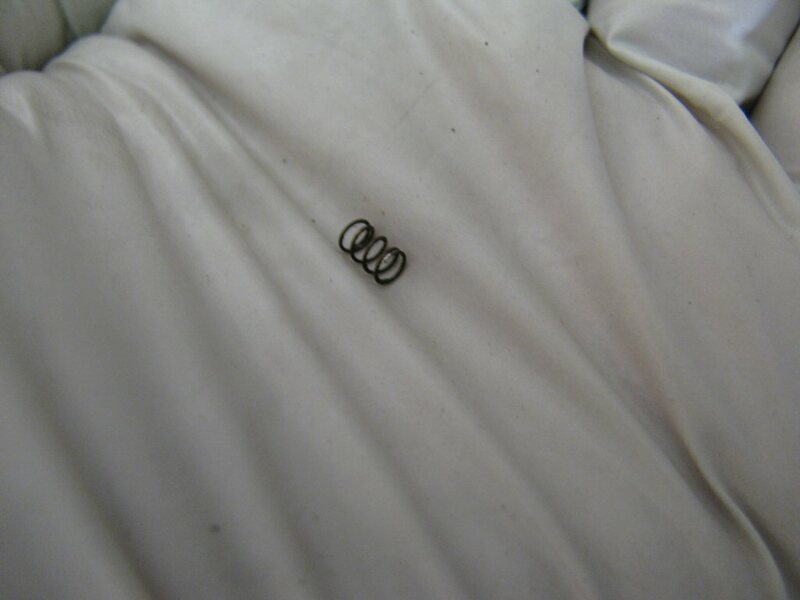 Here is the tiny spring. 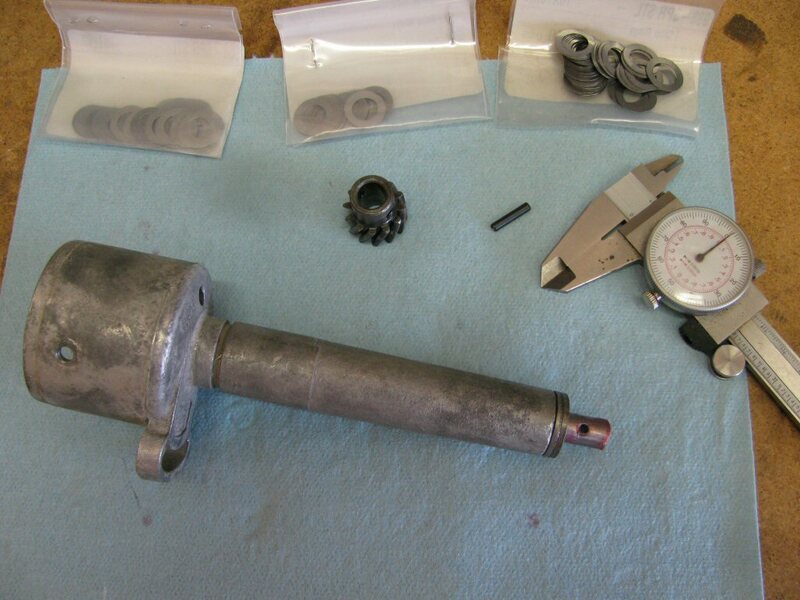 Remove the other advance weight. 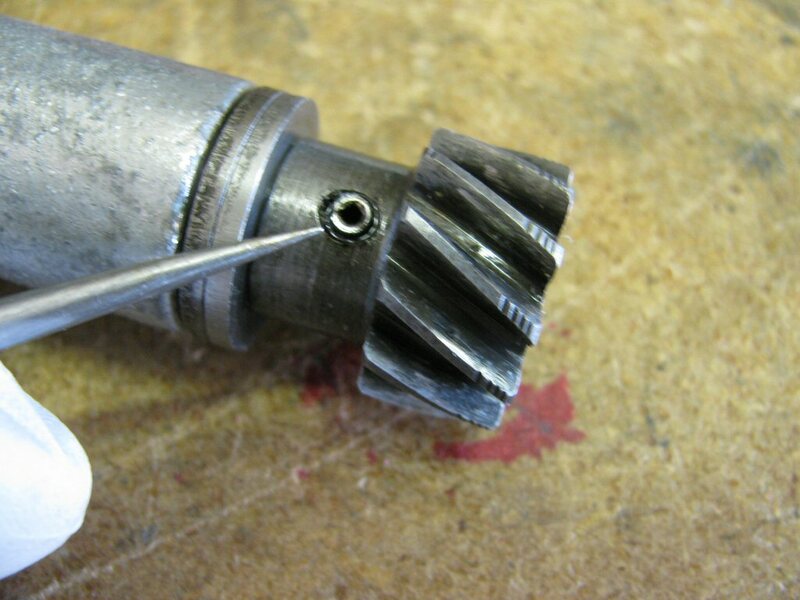 Remove the pin that secures the gear to the shaft. 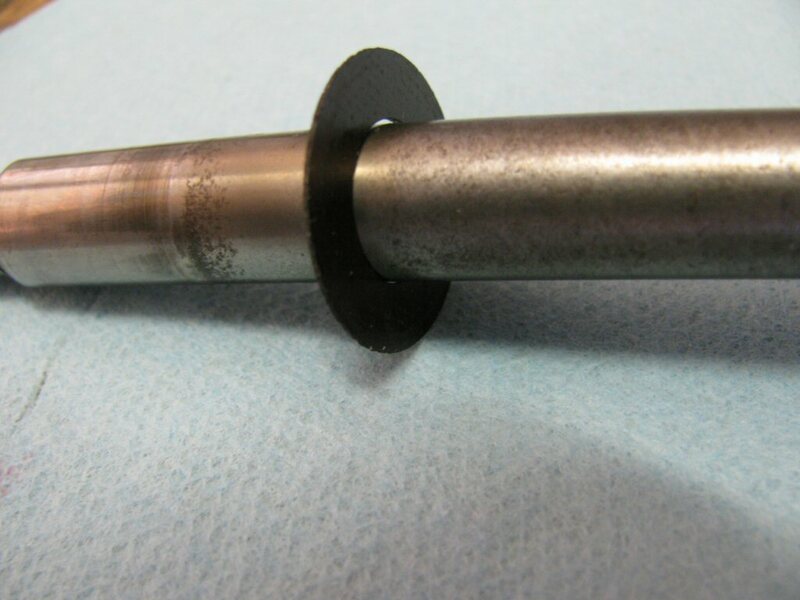 From the factory, this pin is solid and peened at both ends. 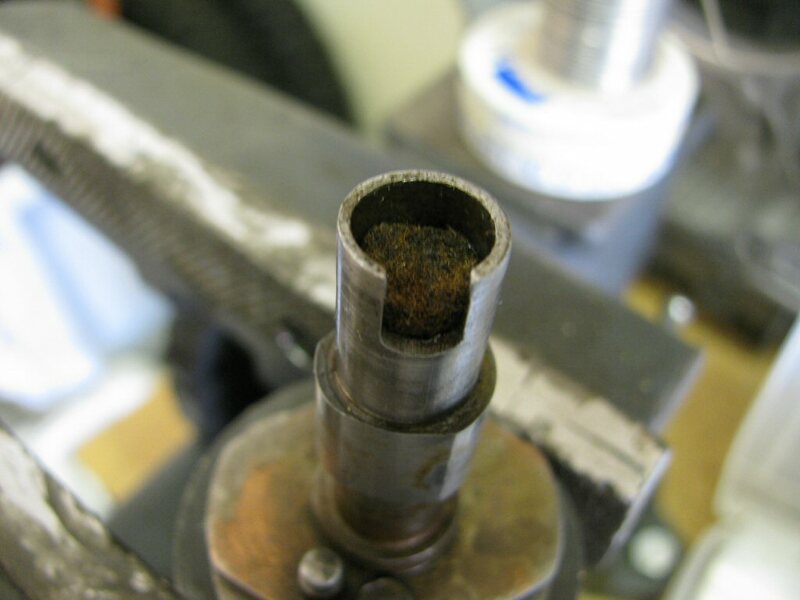 This roll pin was replaced during a previous rebuild. Comparatively speaking, roll pins are very easily removed. The solid pins can be difficult. 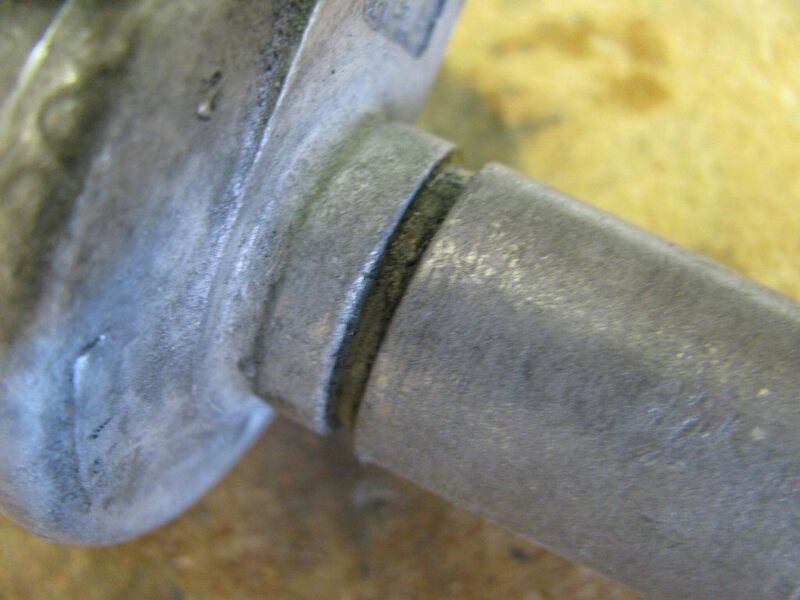 Please reference the techniques elsewhere on this page for guidance on removing the solid pin. 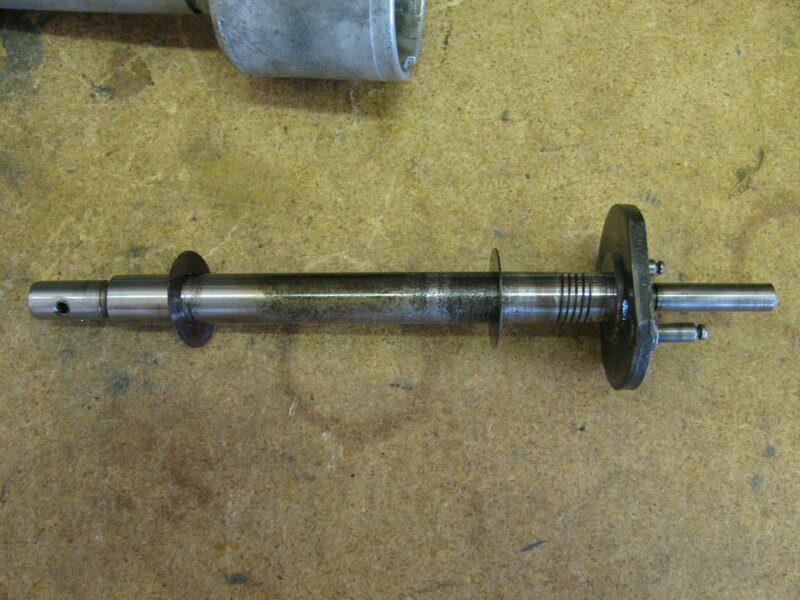 Here is the roll pin driven most of the way out. 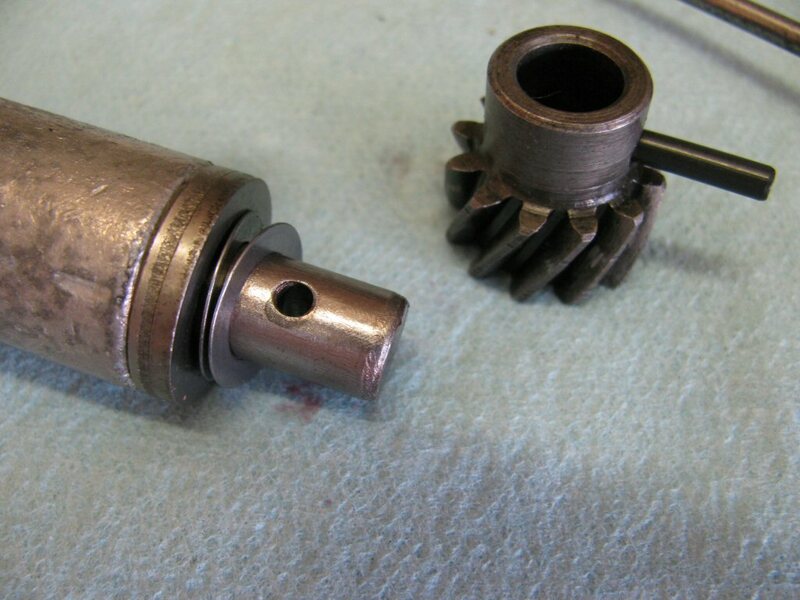 The drive gear can be removed. 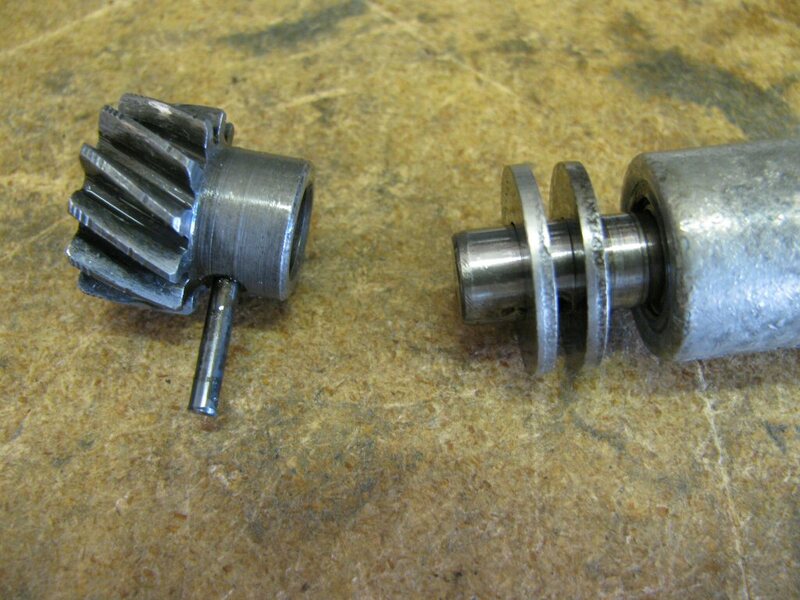 Then the shimming washer (nearest the drive gear) and the spacer washer (furthest from the drive gear). 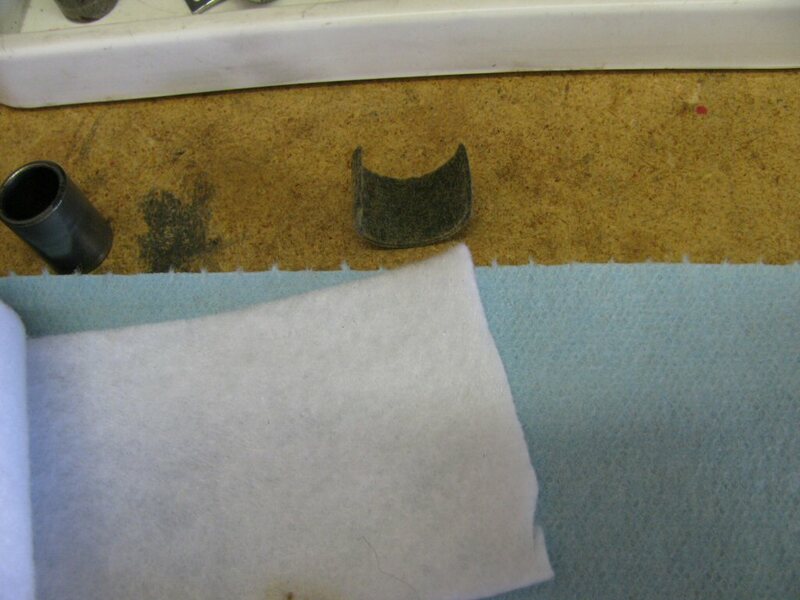 Typically the shimming washer is much thinner than the one shown. 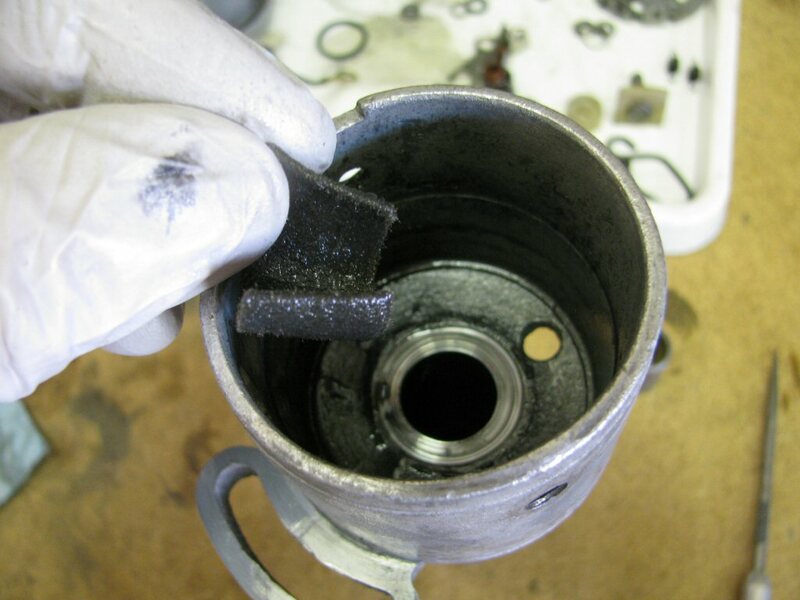 However, this distributor was previously rebuild and this shimming washer was fit in place. 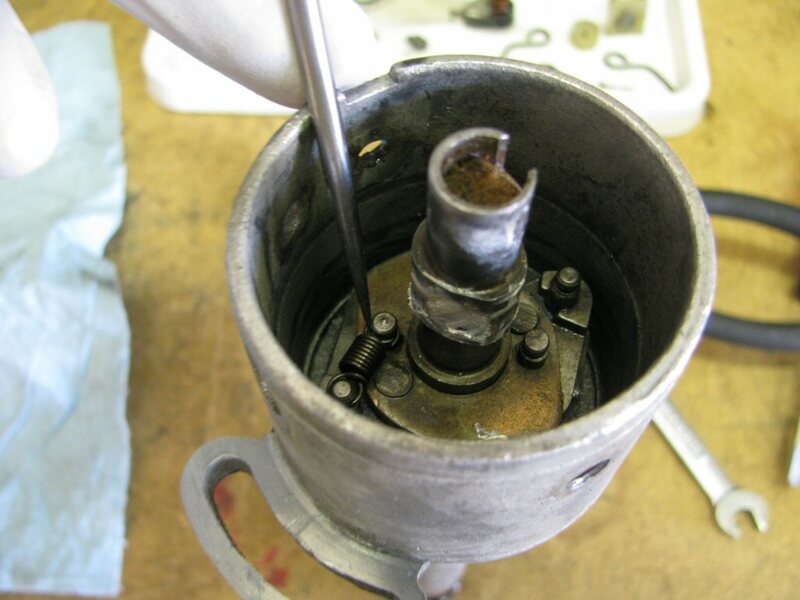 Here is a larger photo of rotating shaft starting to be removed. 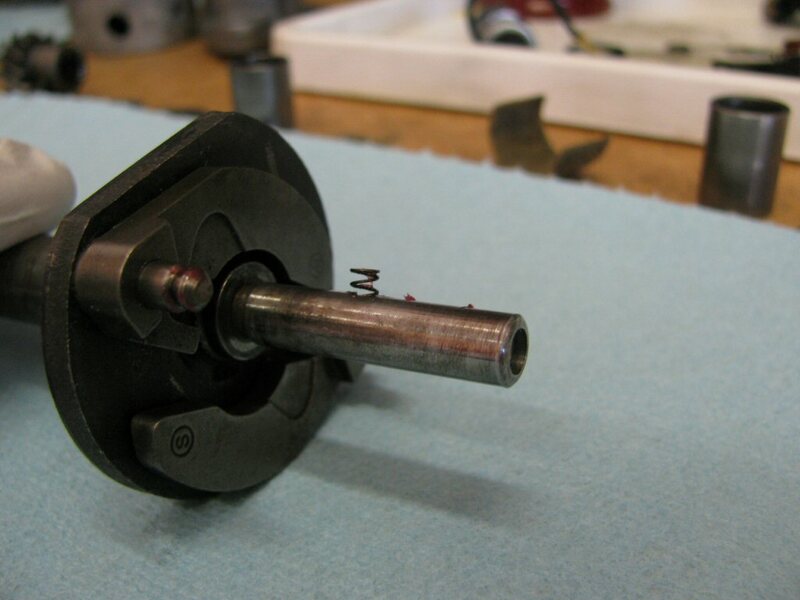 Here is the rotating shaft with the bakelite washer and a thin flat washer. 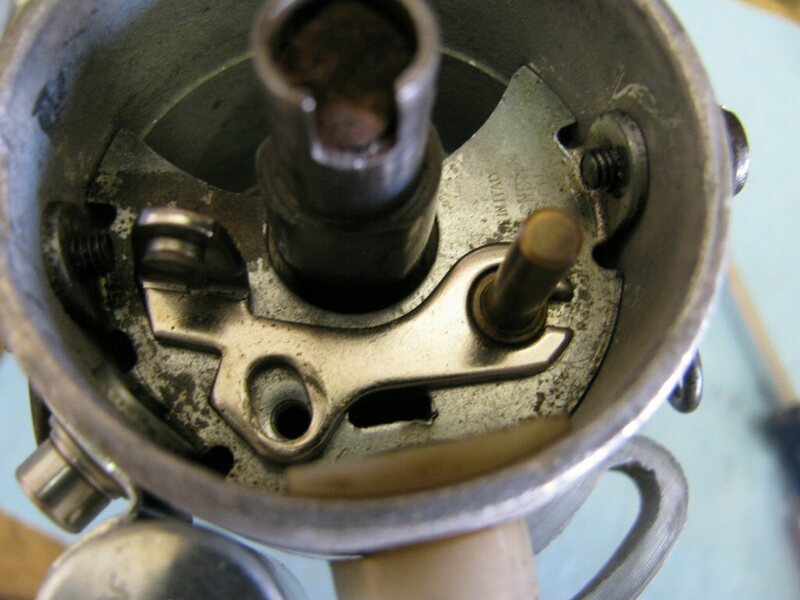 Note that the bakelite washer is furthest from the top of the rotating shaft; the thin flat washer is positioned at the top of the shaft. Note these spiral cuts. 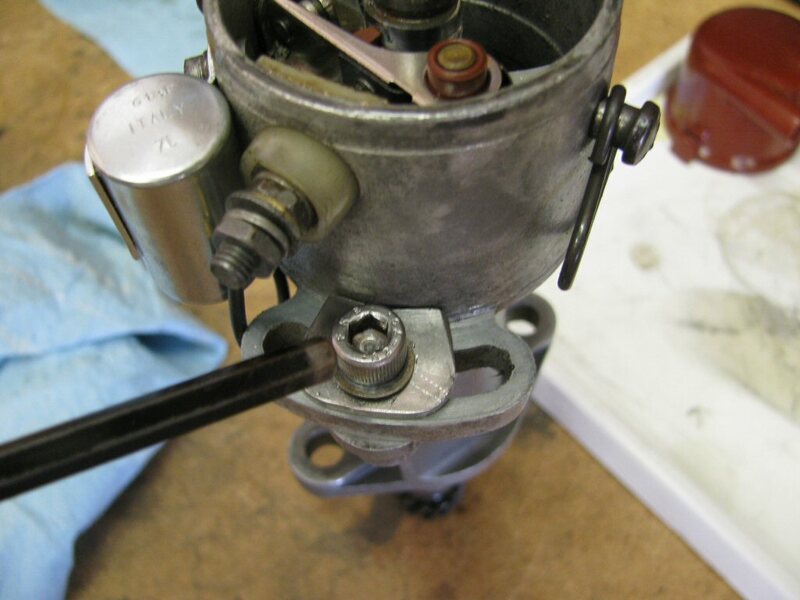 The purpose of these cuts is to direct oil back down into the engine to help prevent oil from migrating into the top of the distributor body. 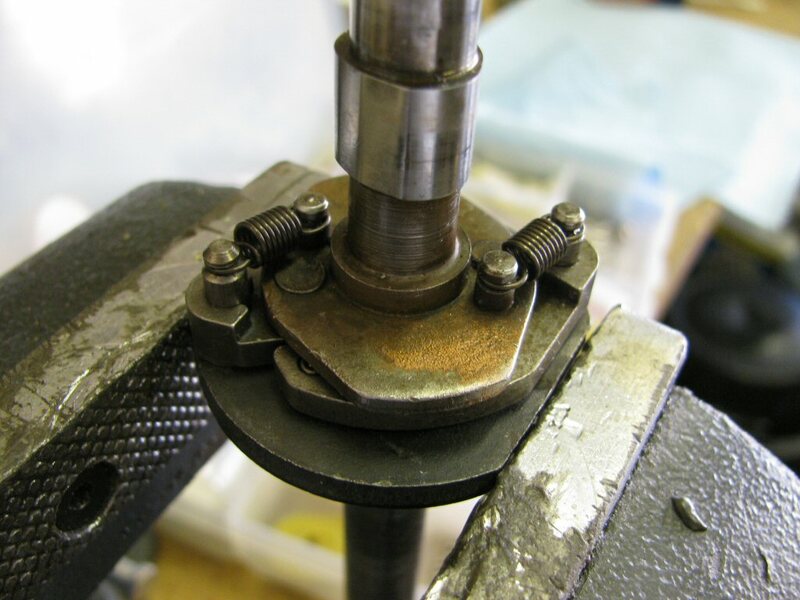 Another photo of the rotating shaft and washers. 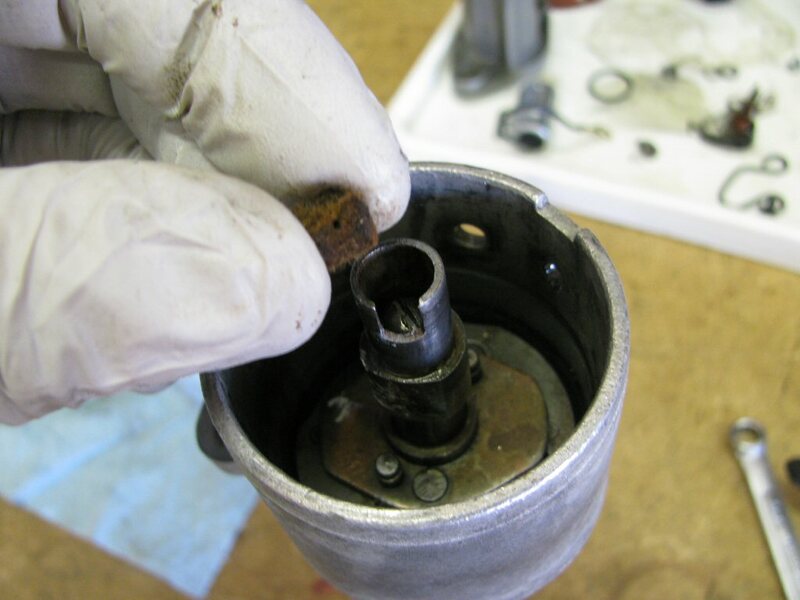 (Optional) Remove the bushing from the bottom of the distributor body. 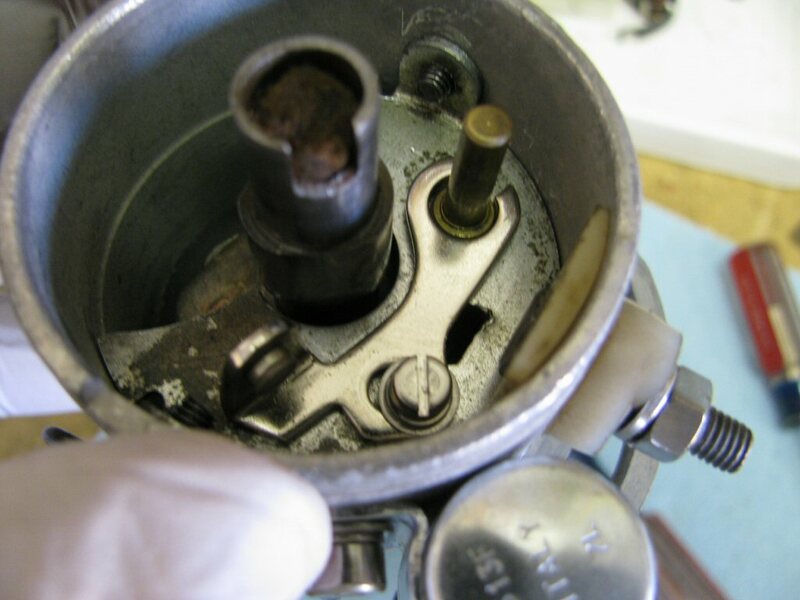 Remove the busing from the top of the distributor body. 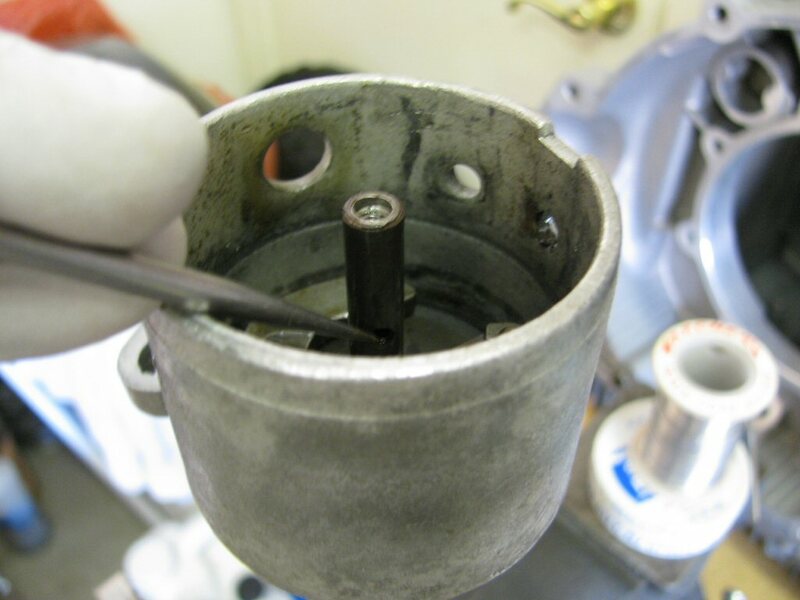 Remove the felt seal from the top of the distributor body. 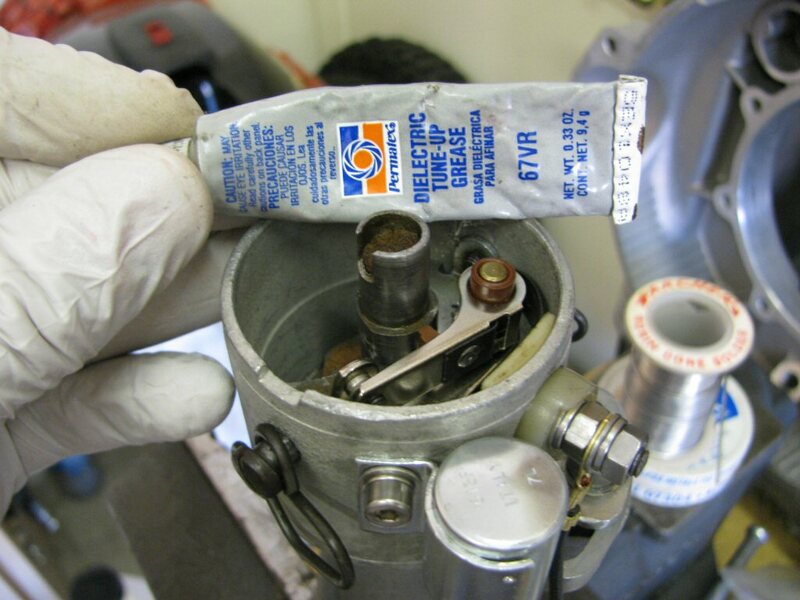 Throughout assembly, I lube components that I assemble with a good quality synthetic grease (Mobil One). 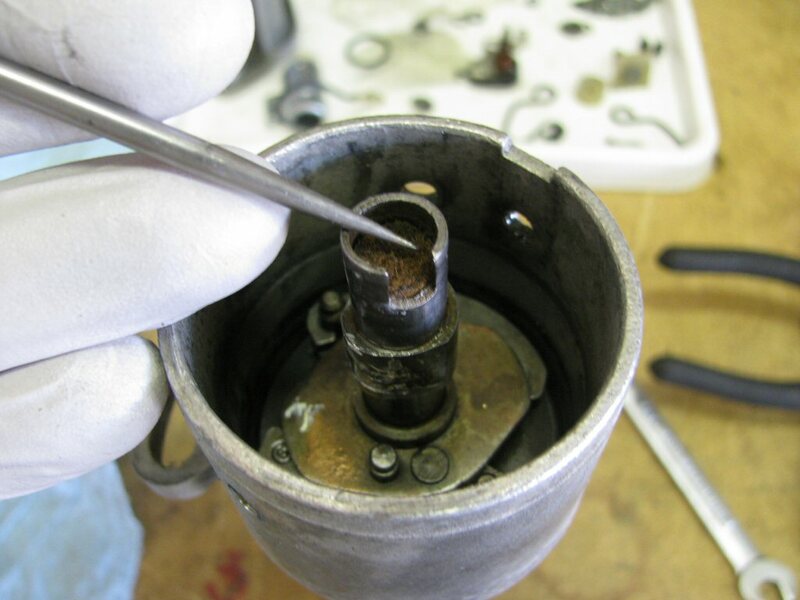 After thoroughly cleaning all of the components, begin assembly with the rotating shaft. 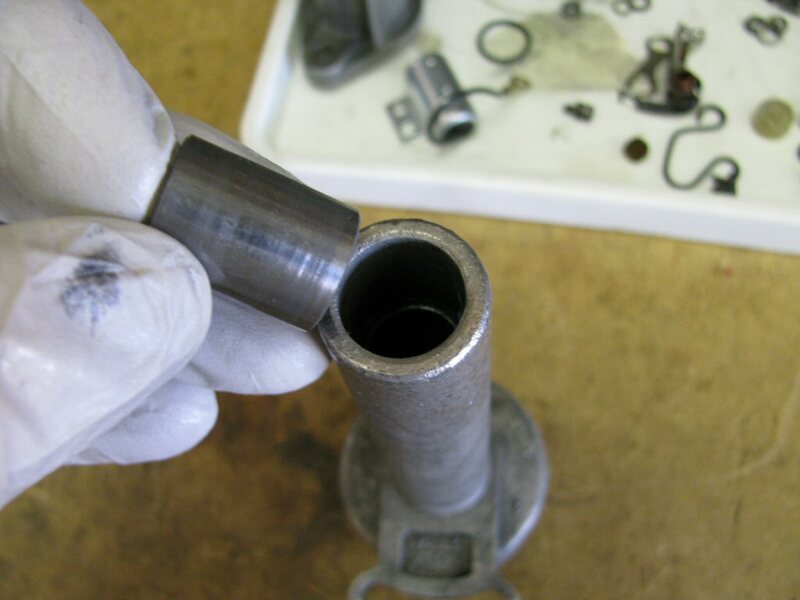 Lube the pivots and fit both advance weights. 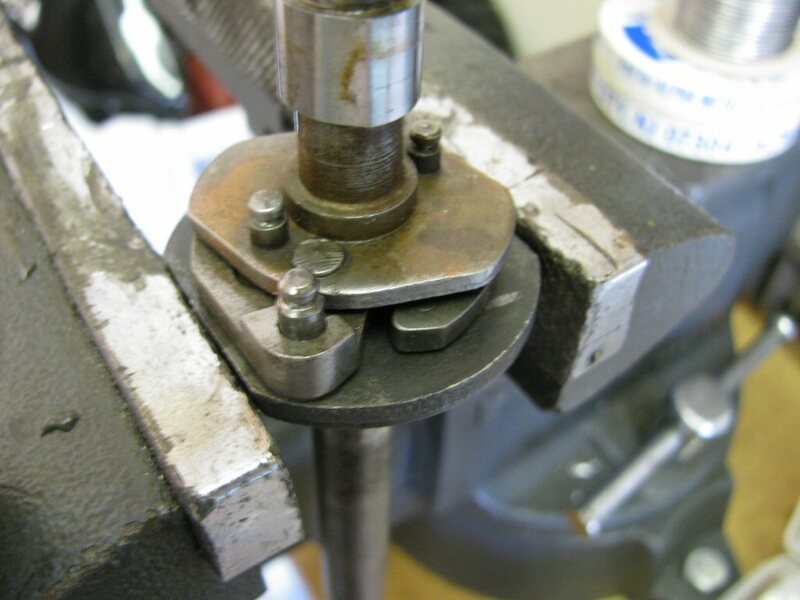 It does not matter which weight you fit to each pivot; the advance weights are interchangeable. 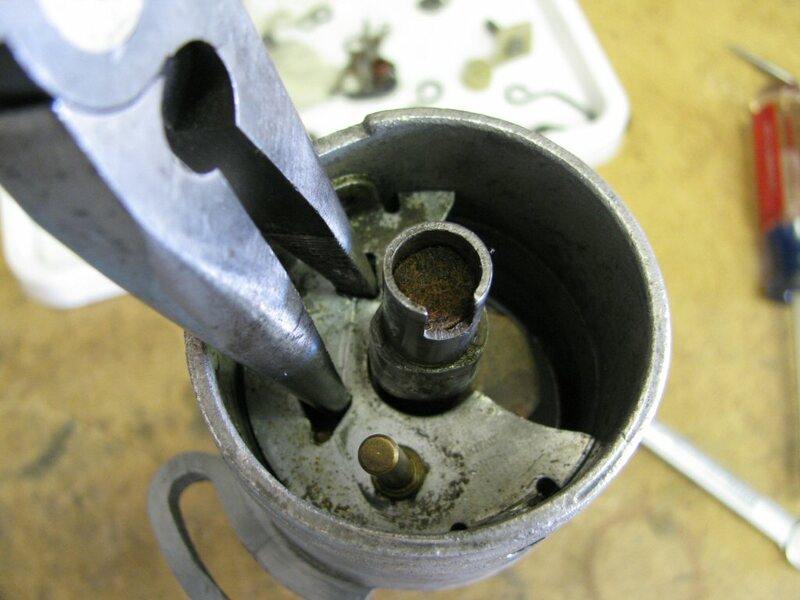 Place a dab of grease on the tiny spring and insert it into the hole in the shaft. 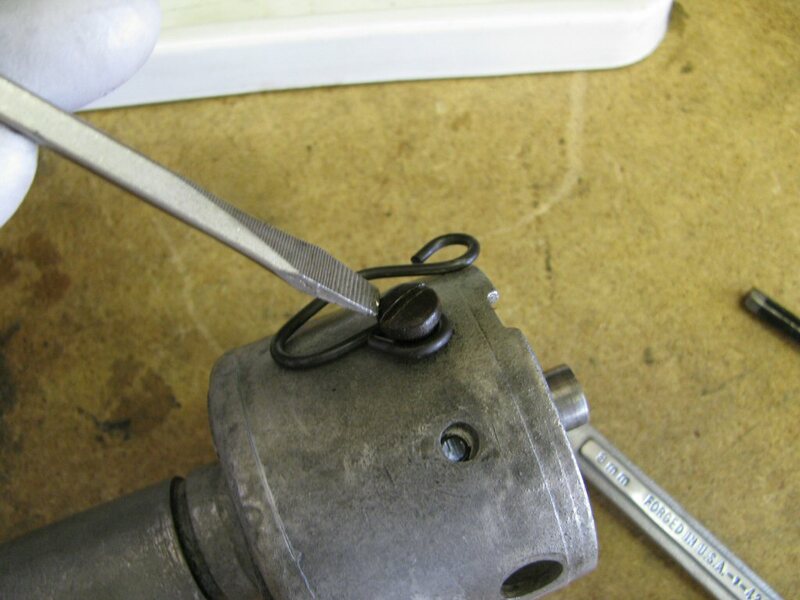 Place a dab of grease on the tiny ball bearing and place it onto the spring. 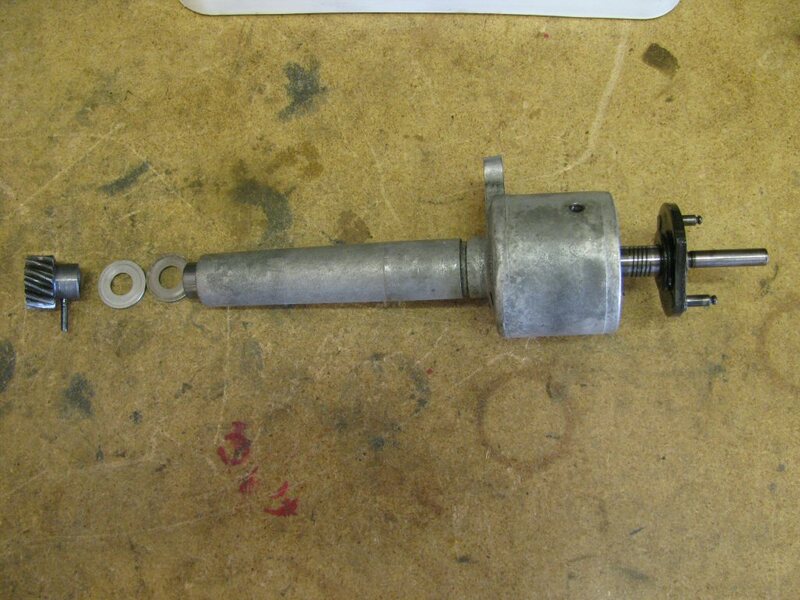 Here is the advance mechanism that will be fit. 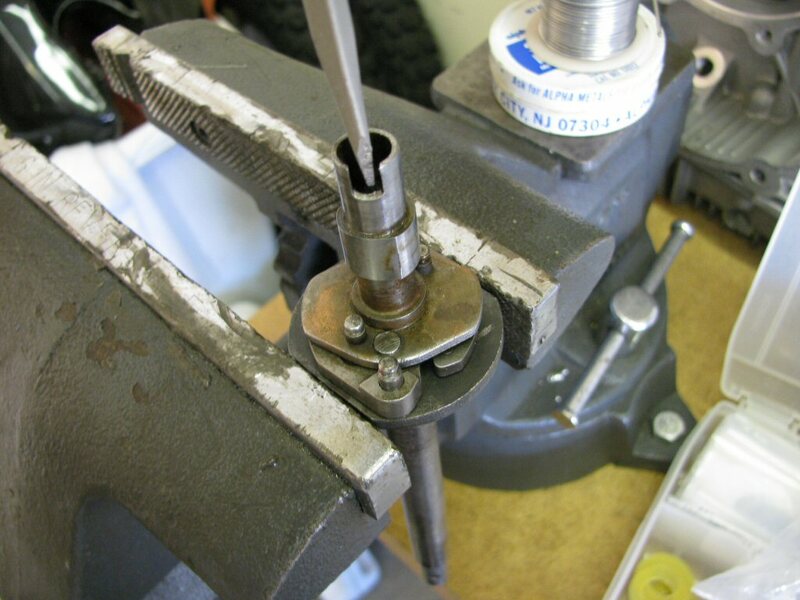 Start to slide the advance mechanism onto the rotating shaft. 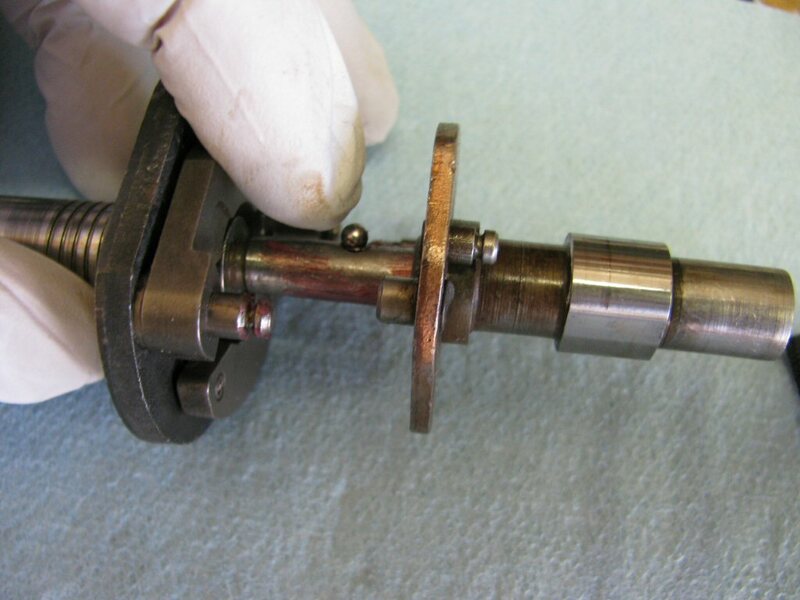 Hold down the tiny ball bearing and spring with your finger and then slide the advance mechanism over the ball bearing, moving your finger back as the advance mechanism moves over the ball bearing. 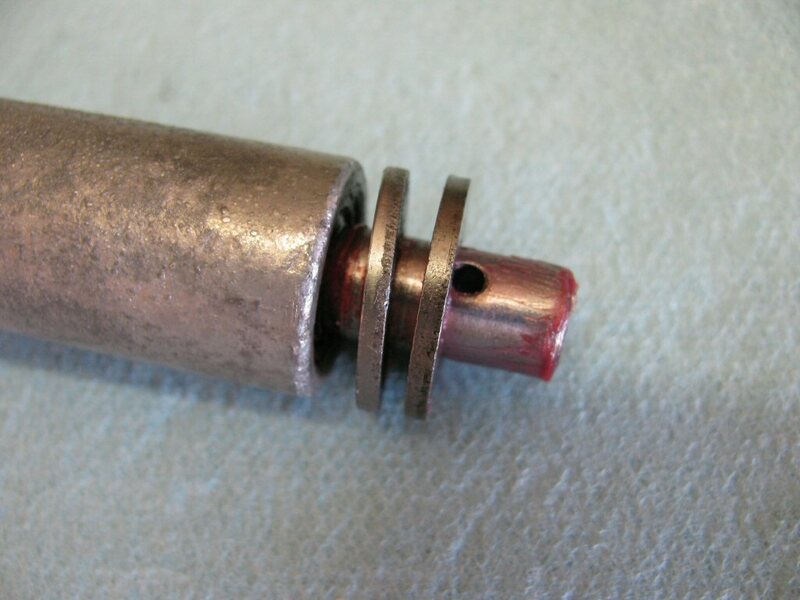 You'll note that the two pins on the bottom of the advance mechanism are not of equal length. 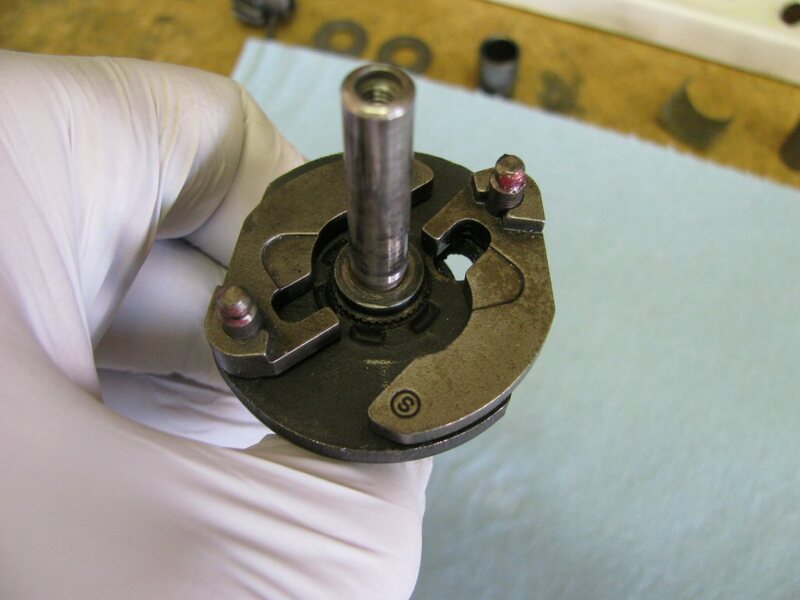 You'll also note that there is a hole in the bottom of the plate that is attached to the rotating shaft. 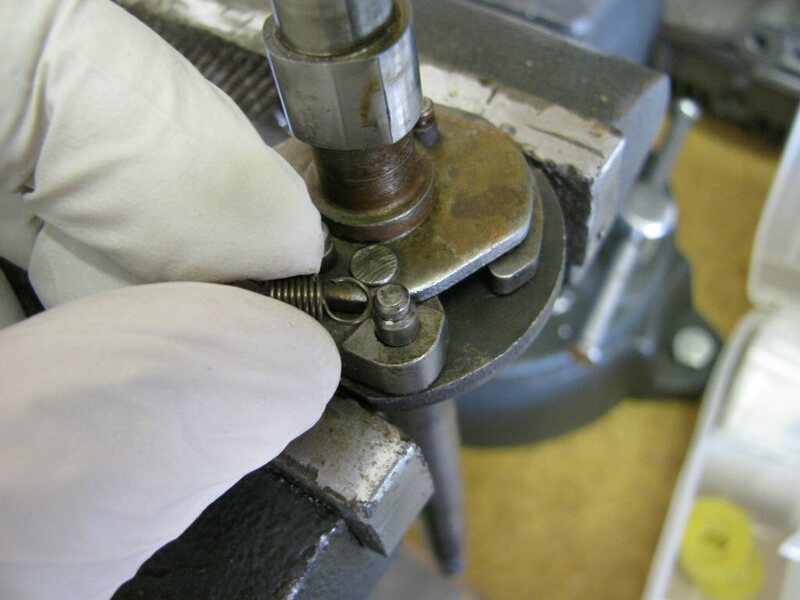 Slide the advance mechanism fully in place such that the longer pin fits into the hole in the plate. 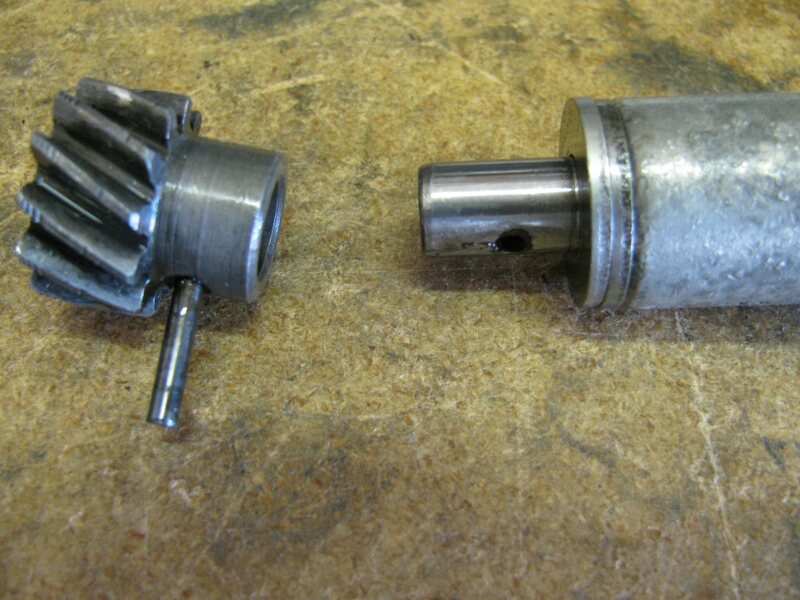 Both pins will also interface with the slots in the advance weights. 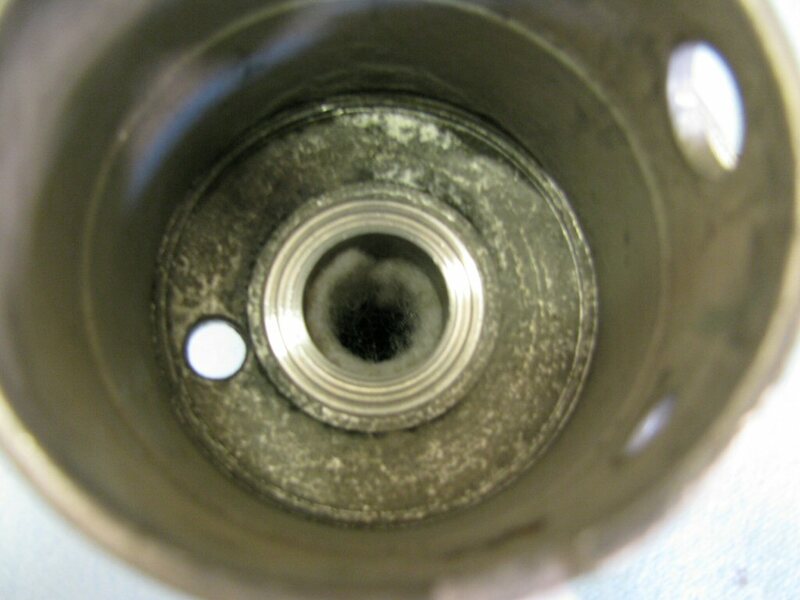 You can see the longer pin through the bottom hole. 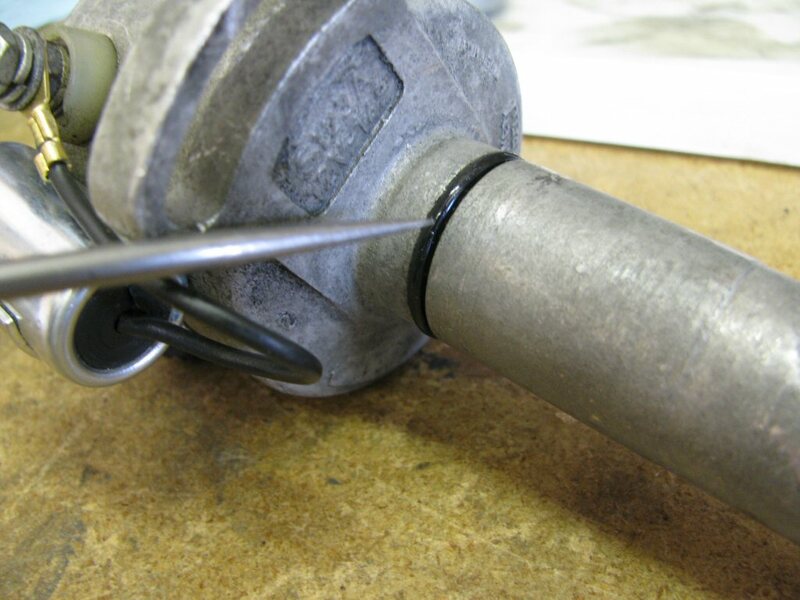 This longer pin limits the total advance and prevents the advance weights from jamming against the sides of the distributor body, should the advance springs break. 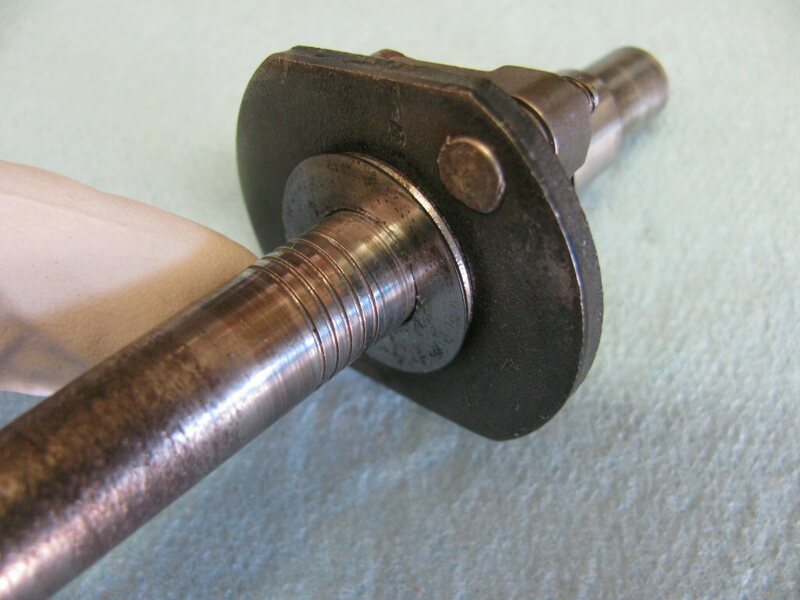 Fit the screw to secure the advance mechanism to the rotating shaft. 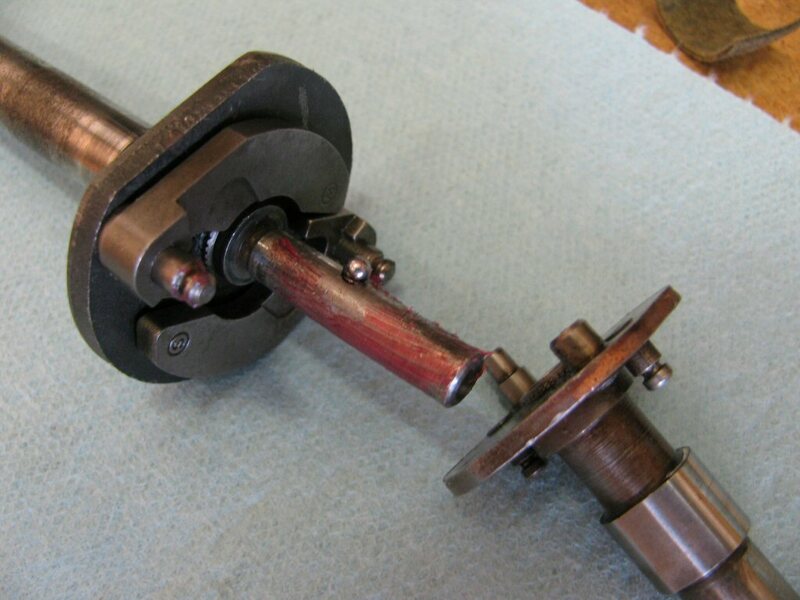 Here is another way to secure the rotating shaft. 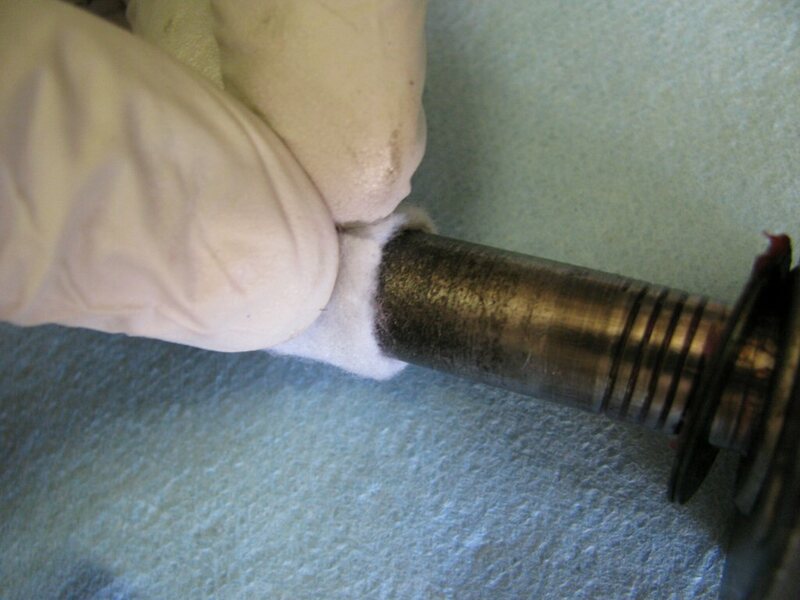 Then place the small felt plug above the screw. Push the small felt plug fully in place. Time to fit the advance springs. 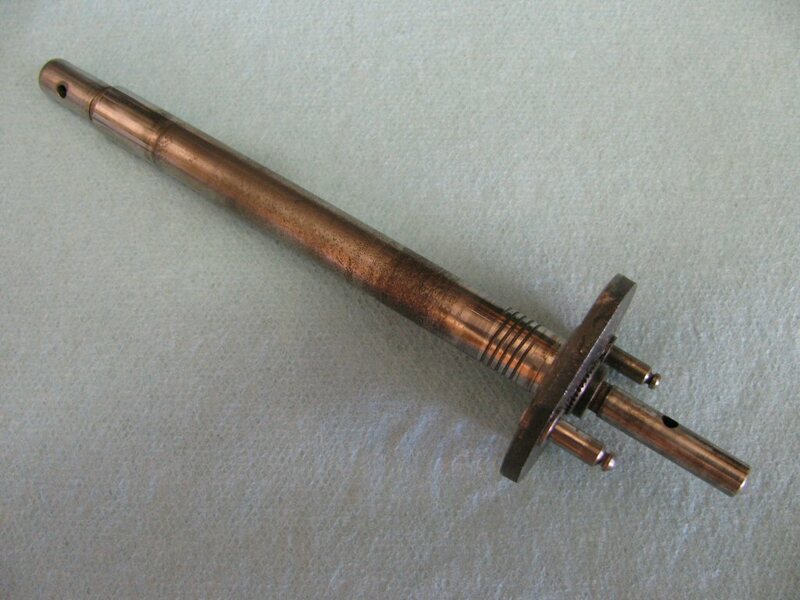 Fit the other advance spring. 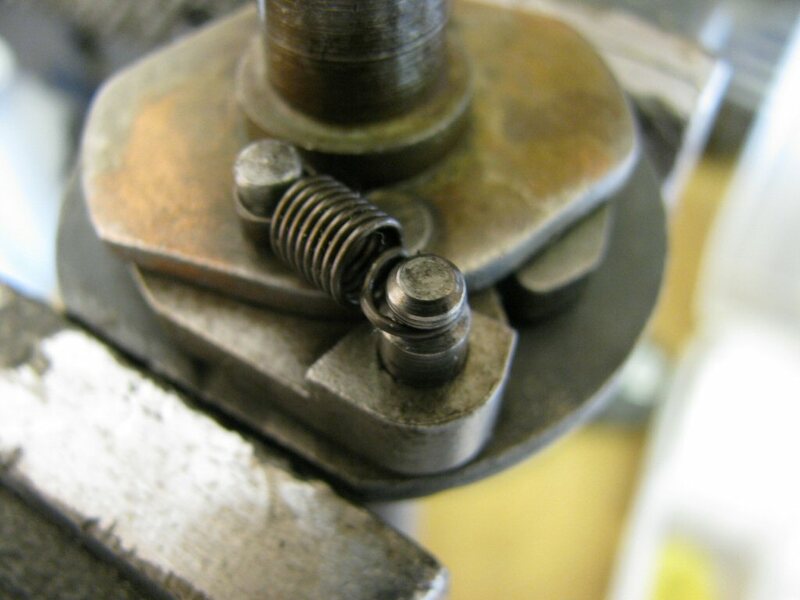 It does not matter which spring goes onto each advance weight. 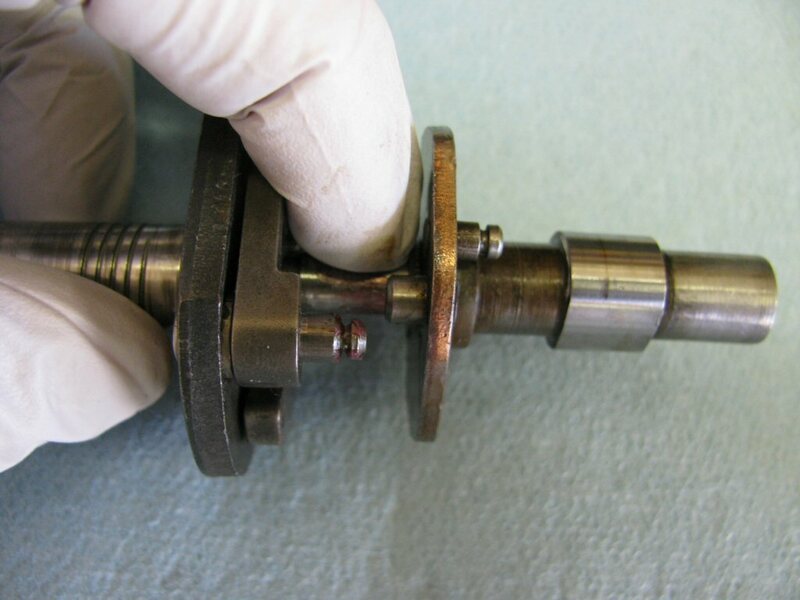 Place the thin flat washer onto the rotating shaft. Slide it up against the underside of the plate. 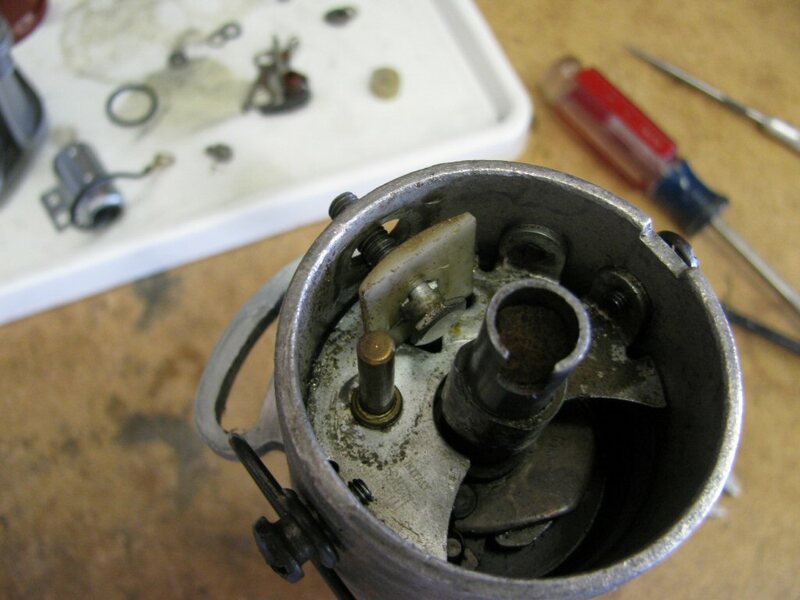 Place the bakelite washer onto the rotating shaft. Slide it up against the thin flat washer. 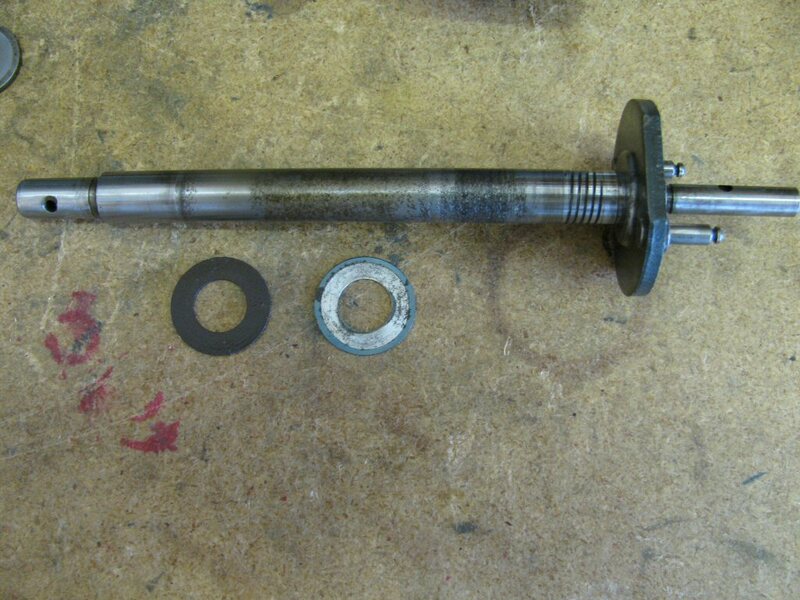 Note that I've lubricated the washers and shaft. 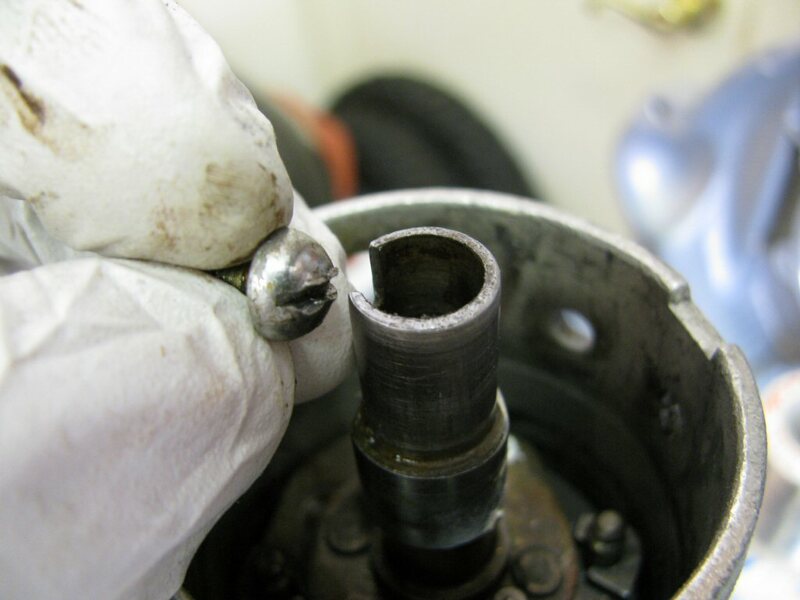 The felt shaft seal should be replaced. 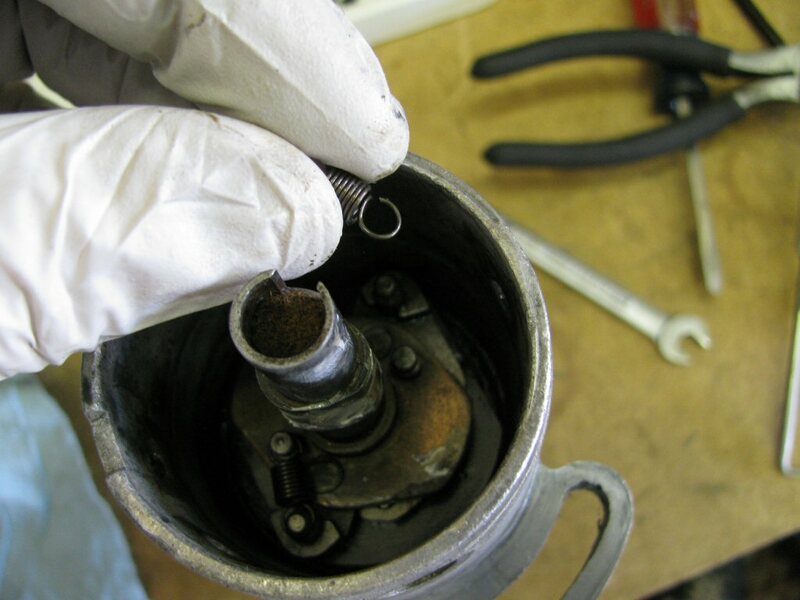 This seal helps keep oil from escaping through the top of the distributor and helps keep the shaft lubricated. There is nothing special about the felt I use...I just purchased it from a fabric store. Cut the felt to size. You'll note the new piece is longer than the old piece. 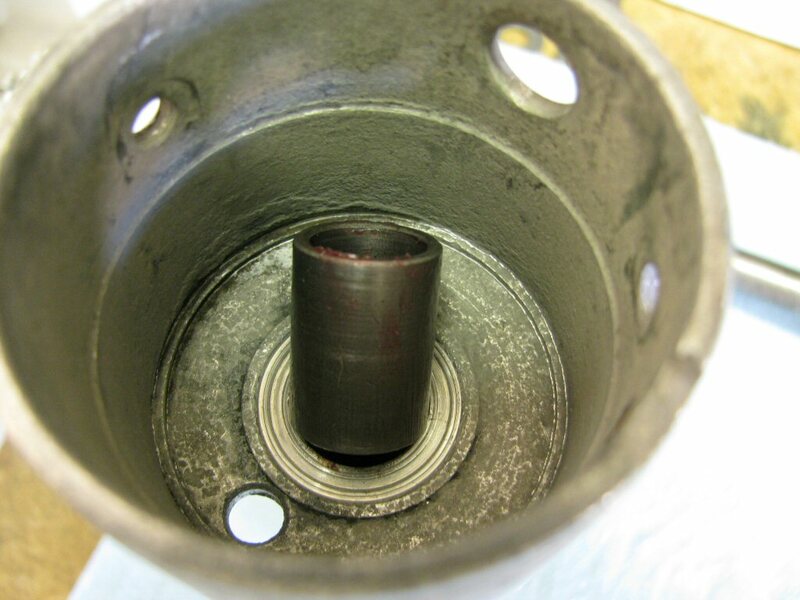 The old piece did not fully wrap around the shaft. This is common after 40 years - the old felt shrinks . 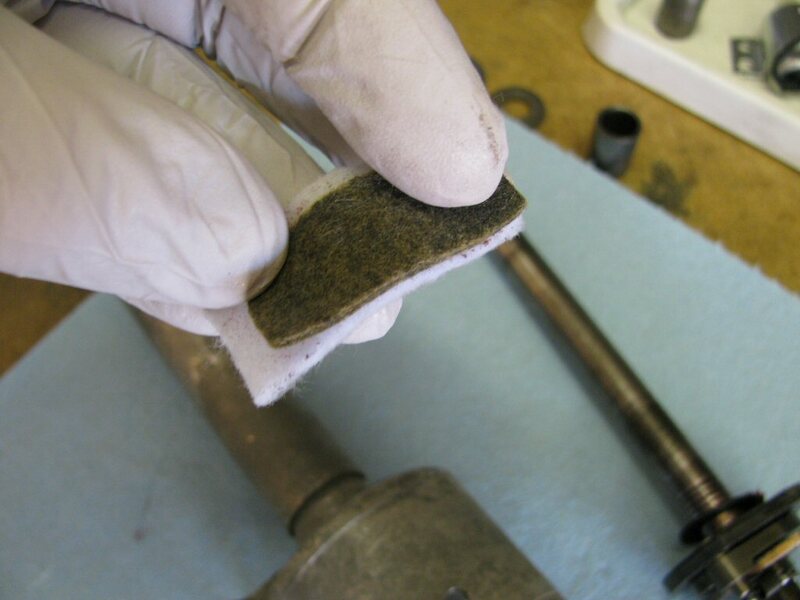 The felt can also become stiff, full of rust, etc. Here is the felt cut to size. 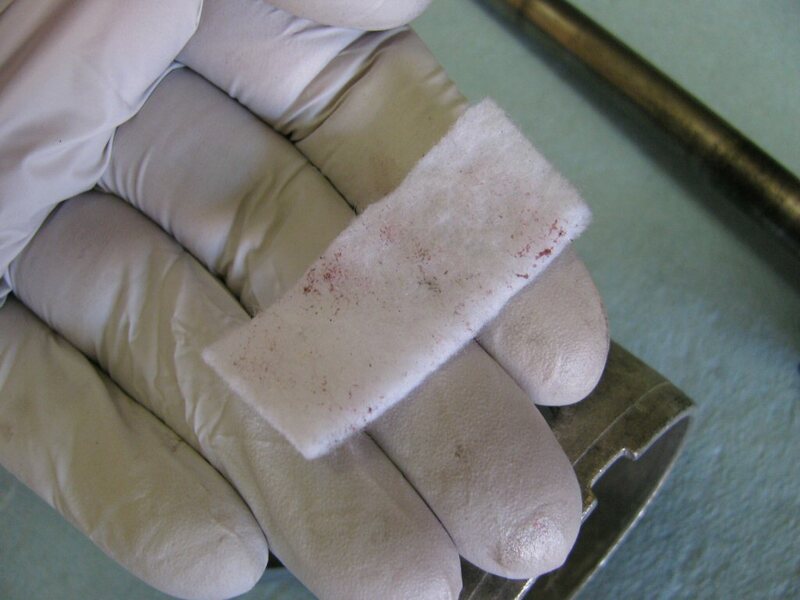 Here is the felt wrapped around the shaft. 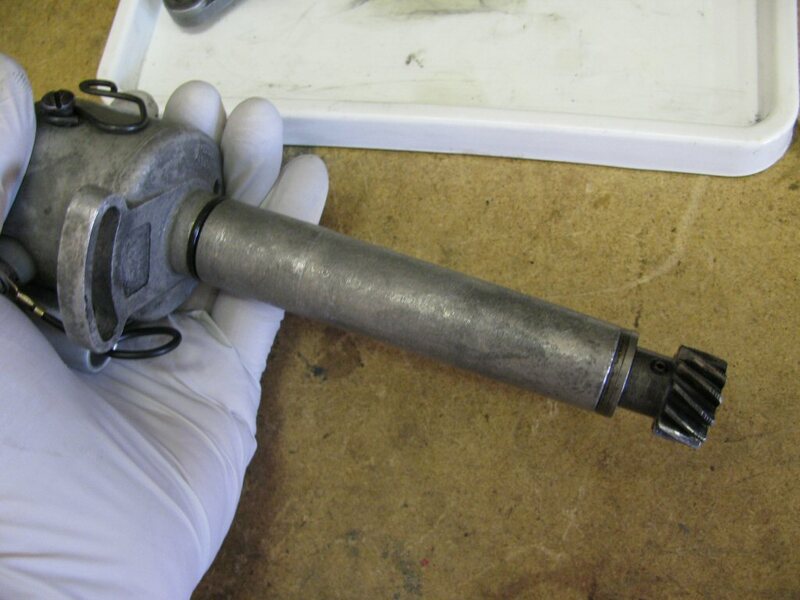 Note that it fully wraps the shaft. Soak the felt in oil. Do not install it dry. 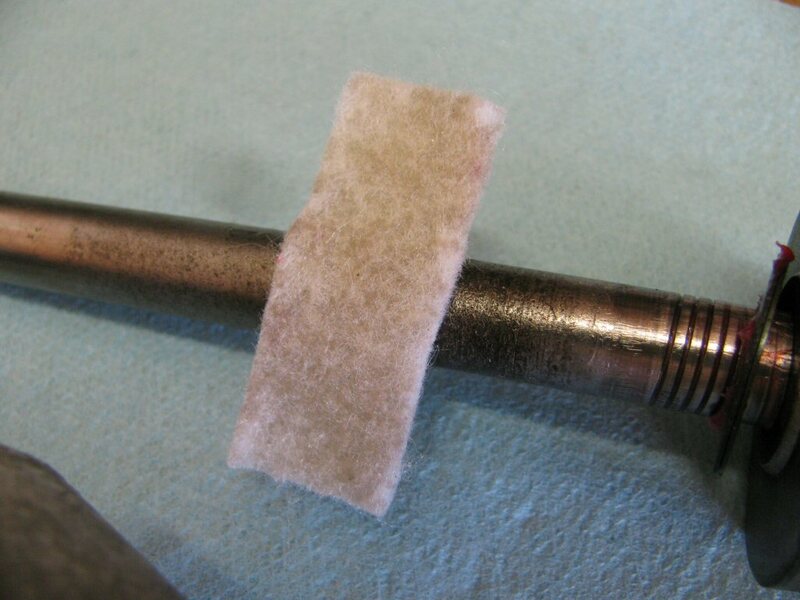 Wrap the felt as shown and insert it into the top of the distributor body. 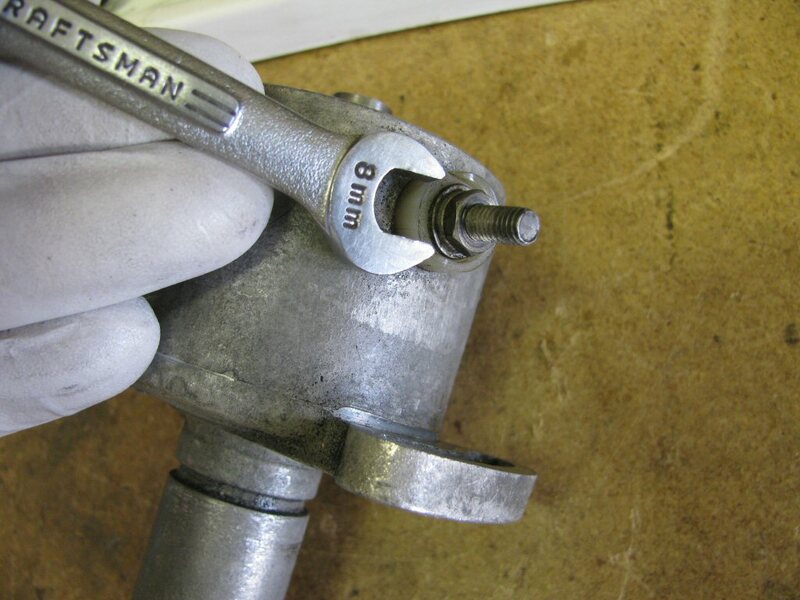 Using a screw driver or similar, get the felt positioned around the ID of the distributor body. 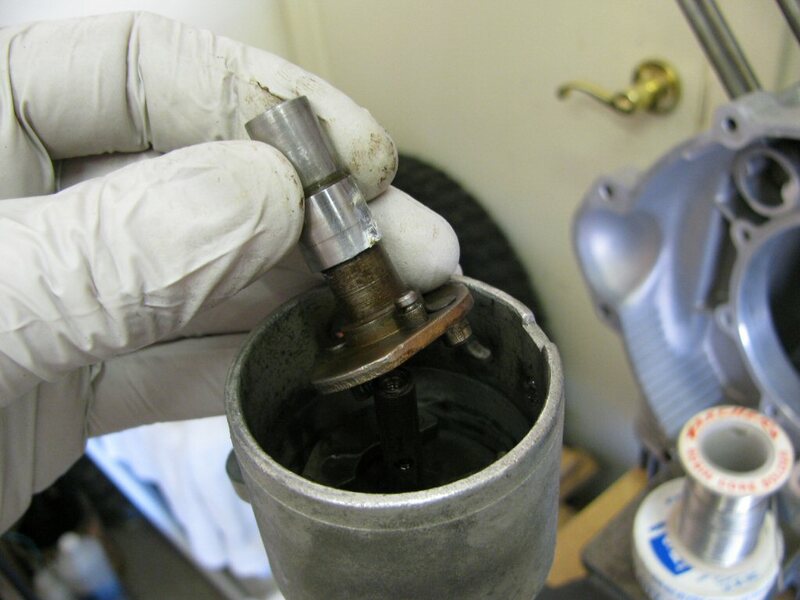 Pushing the bushing into place. 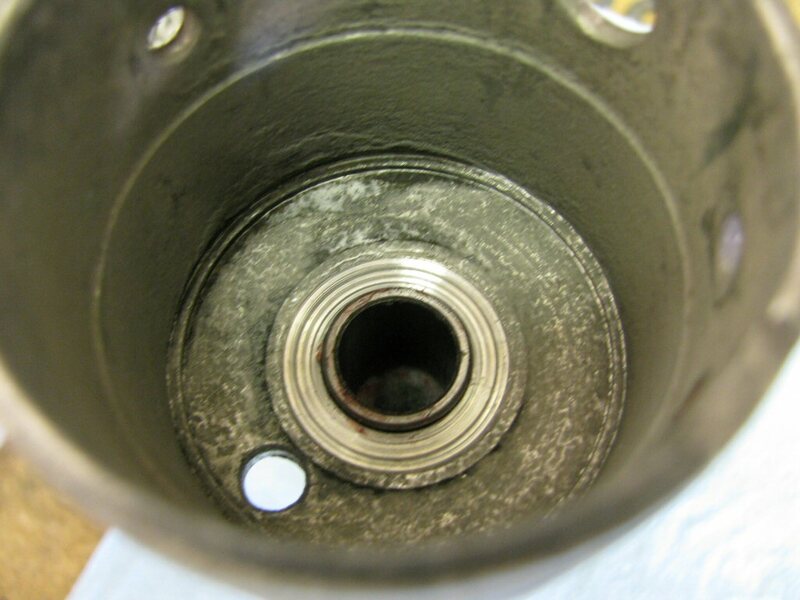 Fit the rotating shaft (fully lubricated). 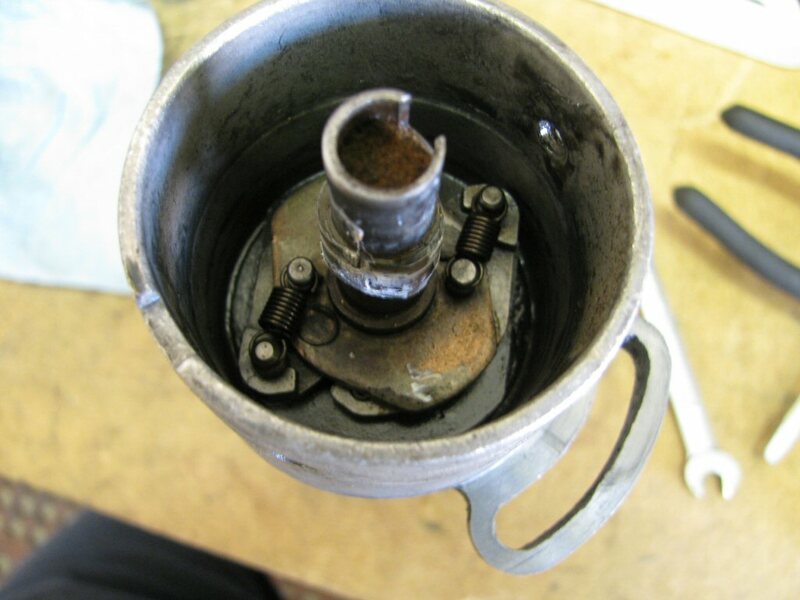 You'll note the bottom bushing is also in place. 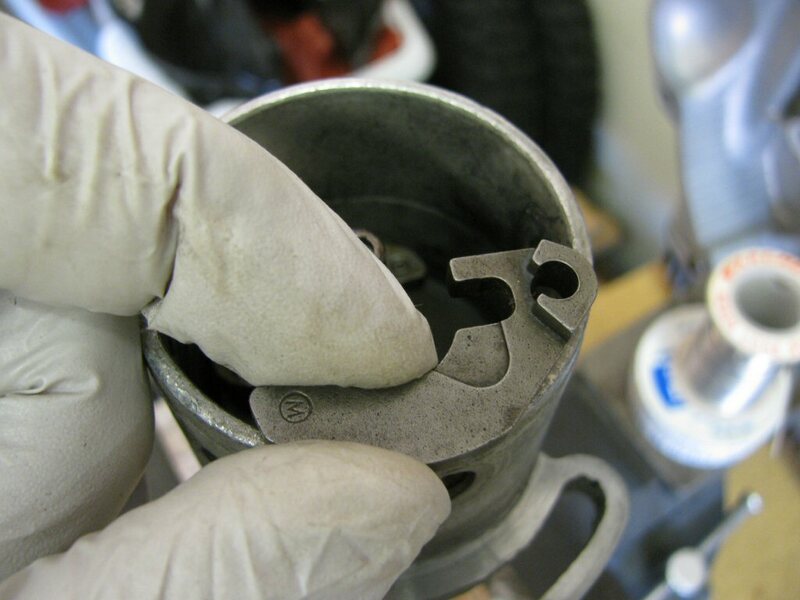 Fit the spacing washer and shimming washer into place (lubricated). 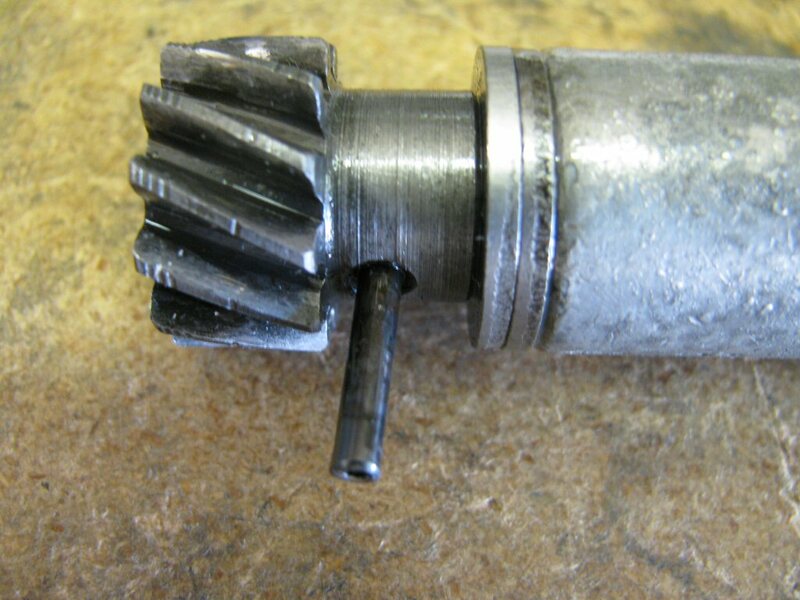 Fit additional shims under the drive gear to achieve a clearance of 0.1 mm to 0.15 mm (~0.004 inch to ~0.006 inch). Every distributor that I've rebuilt has had way too much clearance. 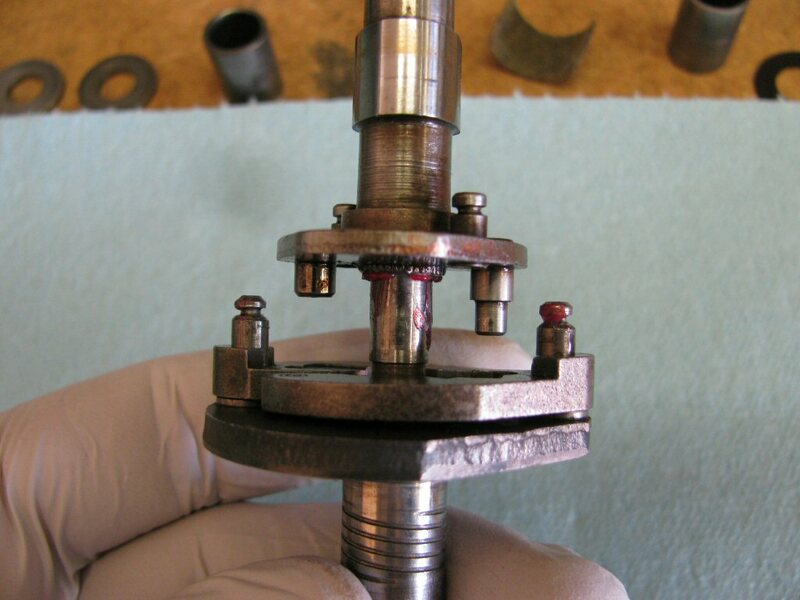 Shimming the shaft properly is an important step. 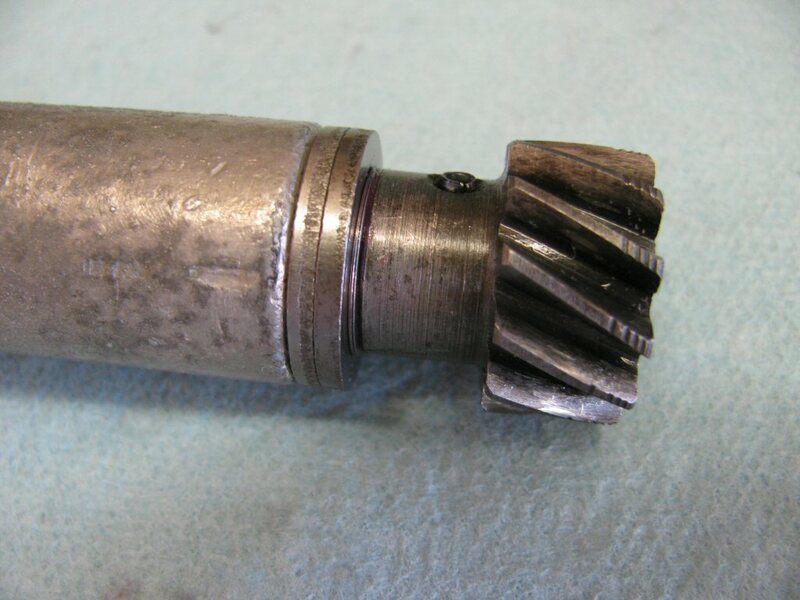 My lifetime supply of replacement roll-pins to secure the drive gear to the rotating shaft. See sizing information here. Tools I use to check the clearance. 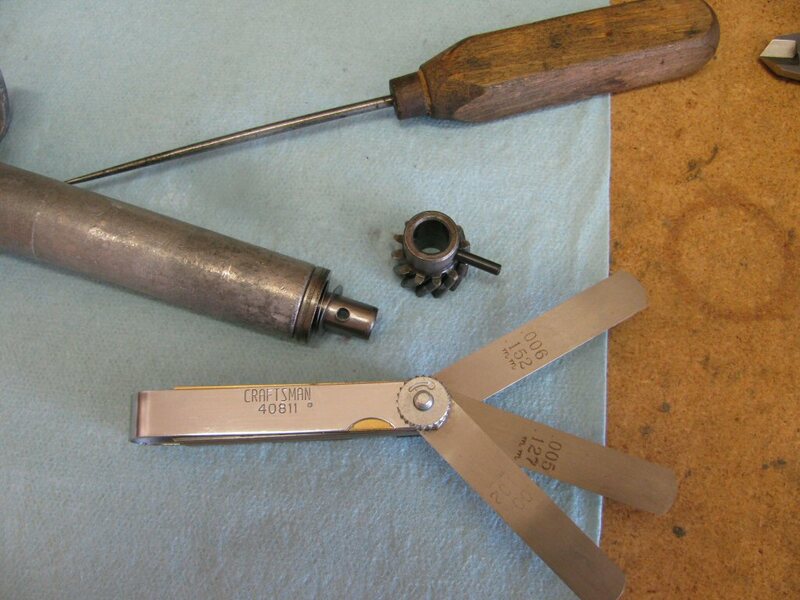 The ice pick is a great size to get close to the needed shims prior to fitting the roll pin. 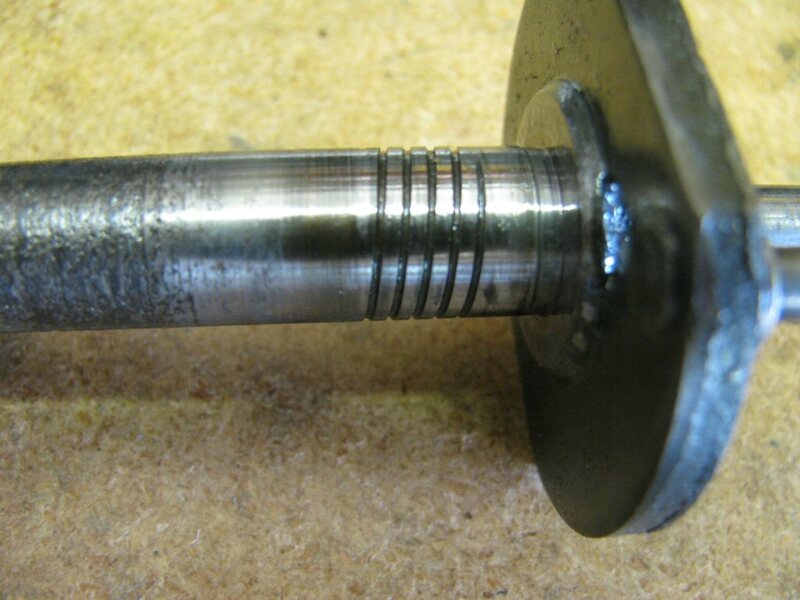 Final adjustment is done with the actual roll pin. 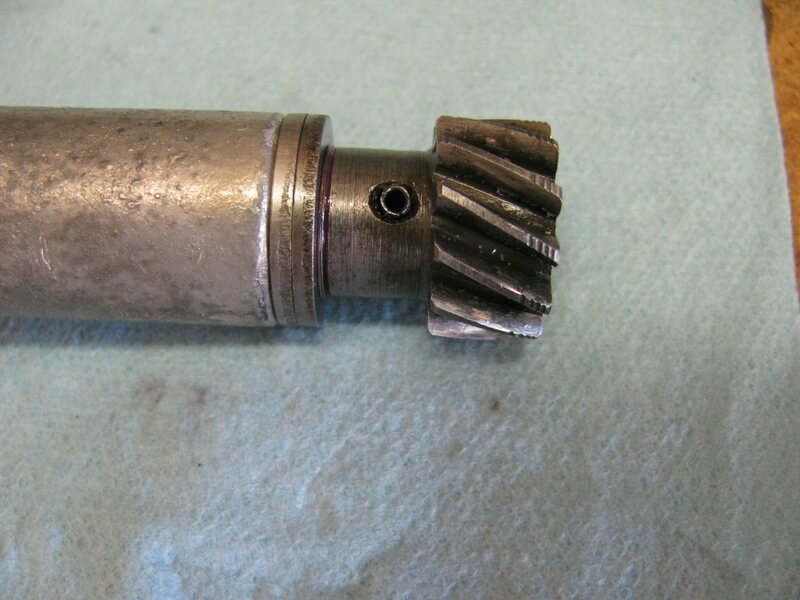 Drive gear back in place. Another view of the drive gear back in place. 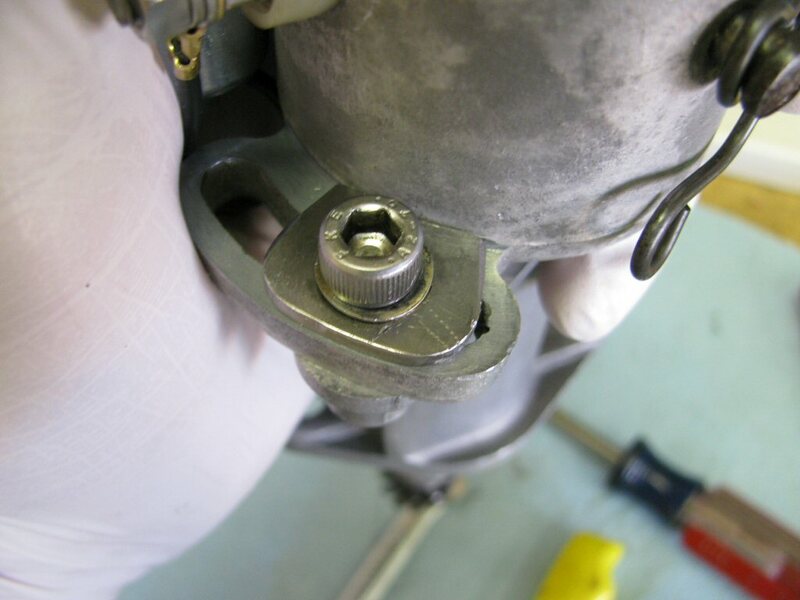 I like to replace the original fasteners with stainless replacements. 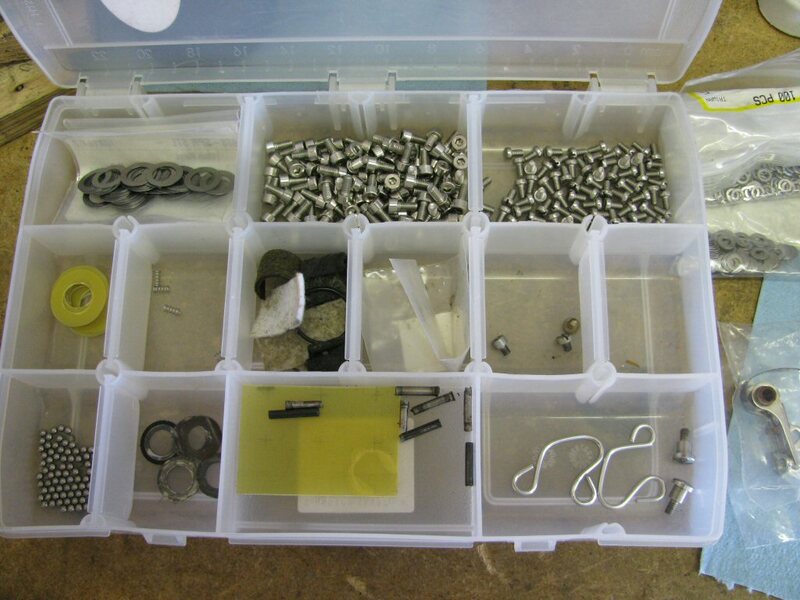 Here is my lifetime supply of distributor related pieces and parts (including replacement bakelite washers!). 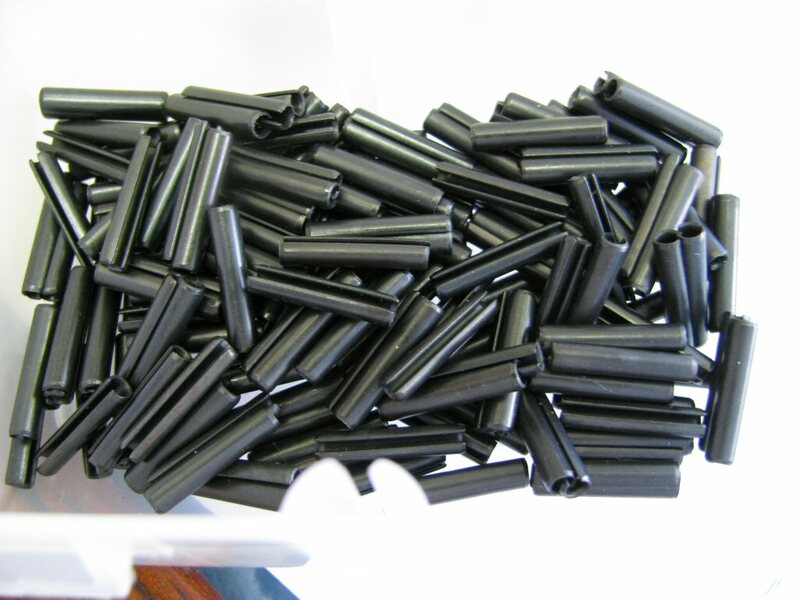 I made the replacement bakelite washers using modern Garolite material that I purchased (McMaster-Carr part number 8667K111). 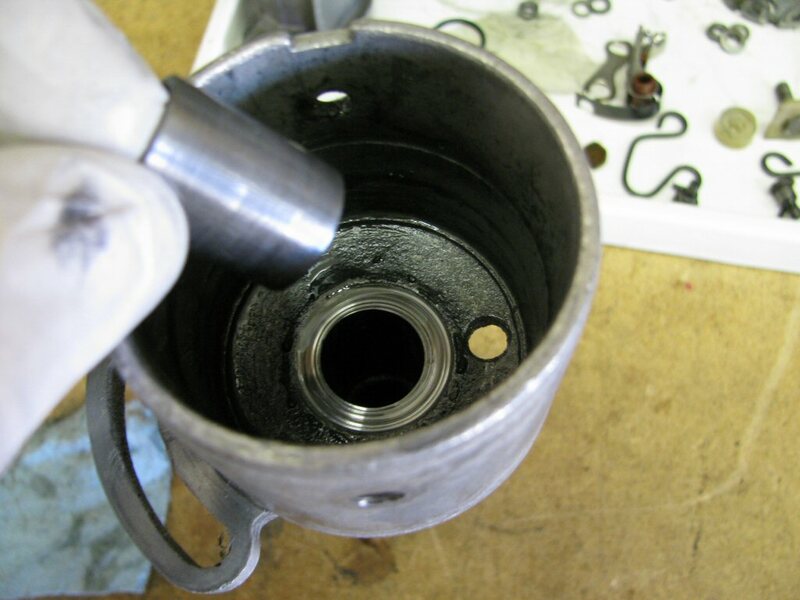 Fit the points-plate so that the two threaded holes match the two holes in the distributor body. 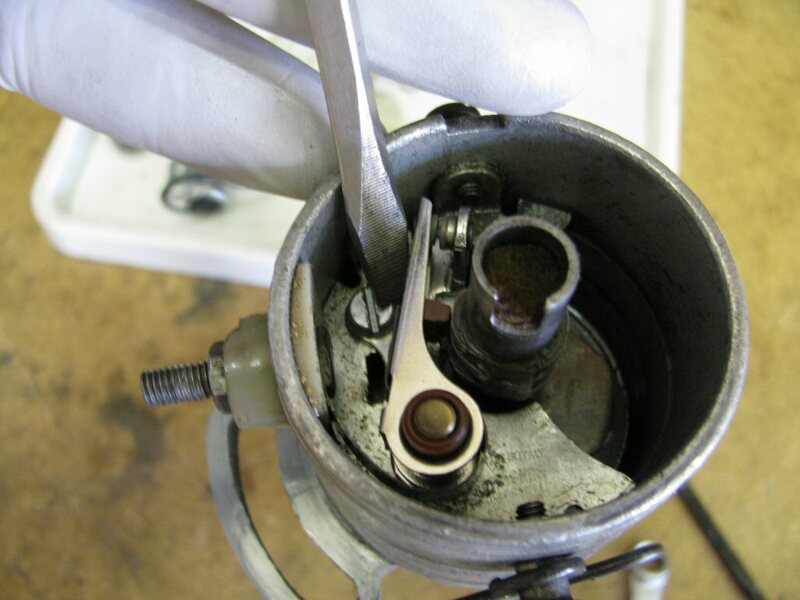 The single threaded hole lines up with the single hole in the distributor body. 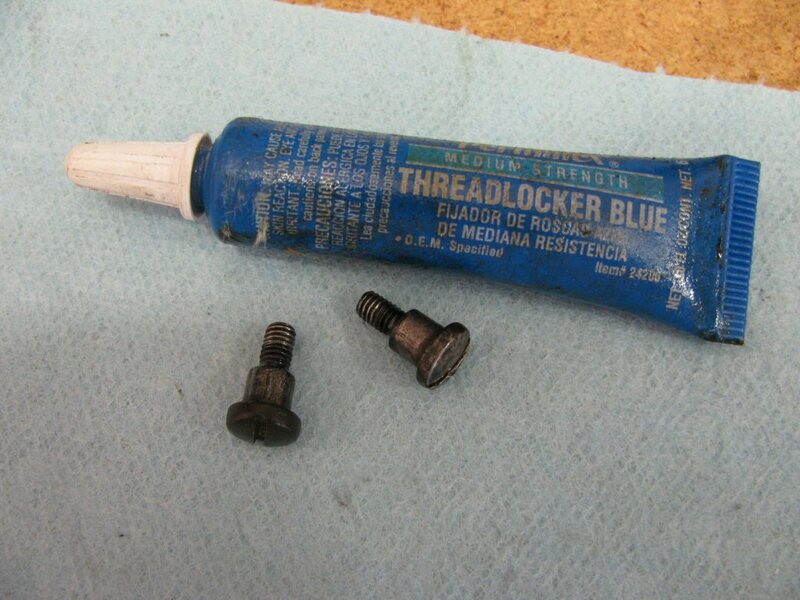 One of the very few places I use blue Loctite. 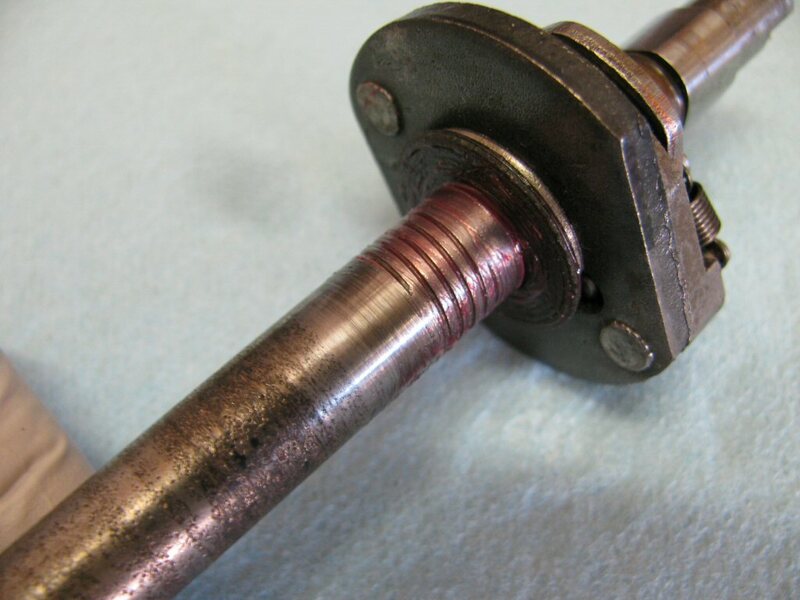 Just a very light application on the threads of the shoulder screws. On the side with two threaded holes, I fit the spring clip and condenser as shown. 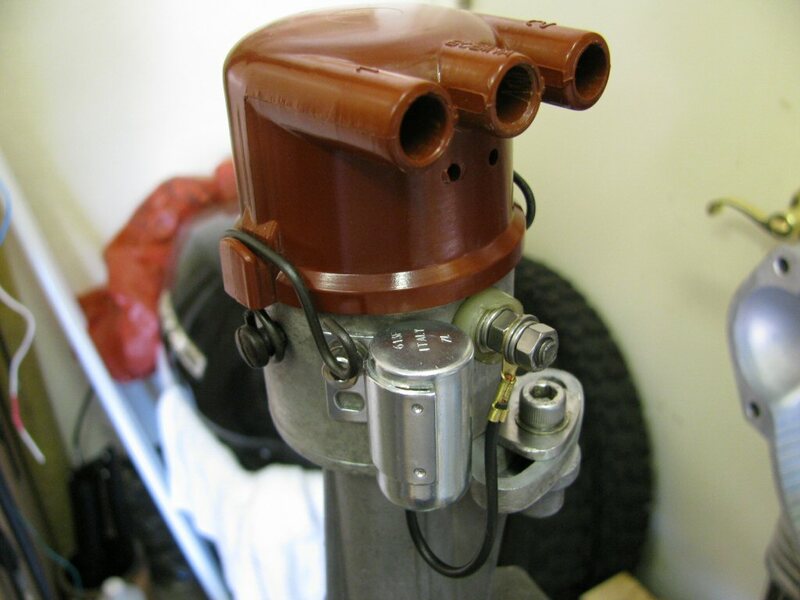 I prefer the spring clip to face this direction as I find it much easier to move into place when the distributor is mounted on the engine case. On the side with one threaded hole, I fit the spring clip as shown. 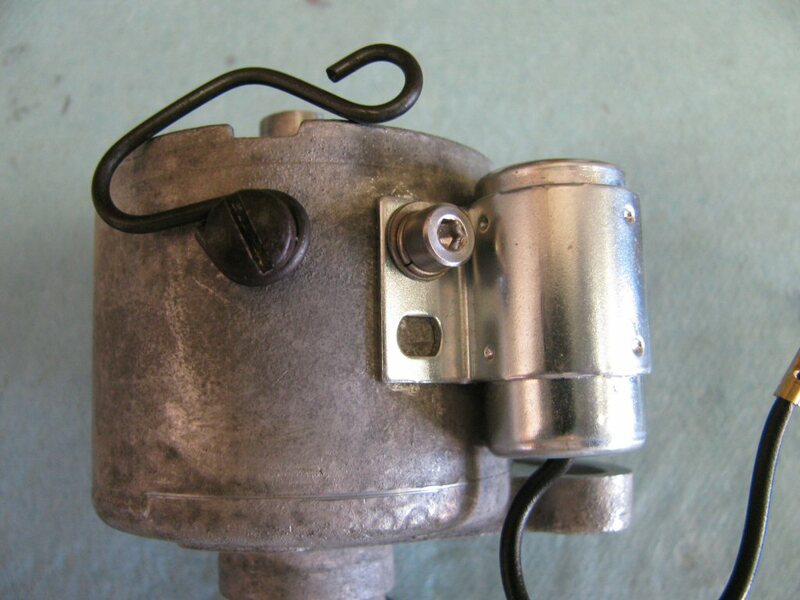 Again, I prefer the spring clip to face this direction as I find it much easier to move into place when the distributor is mounted on the engine case. 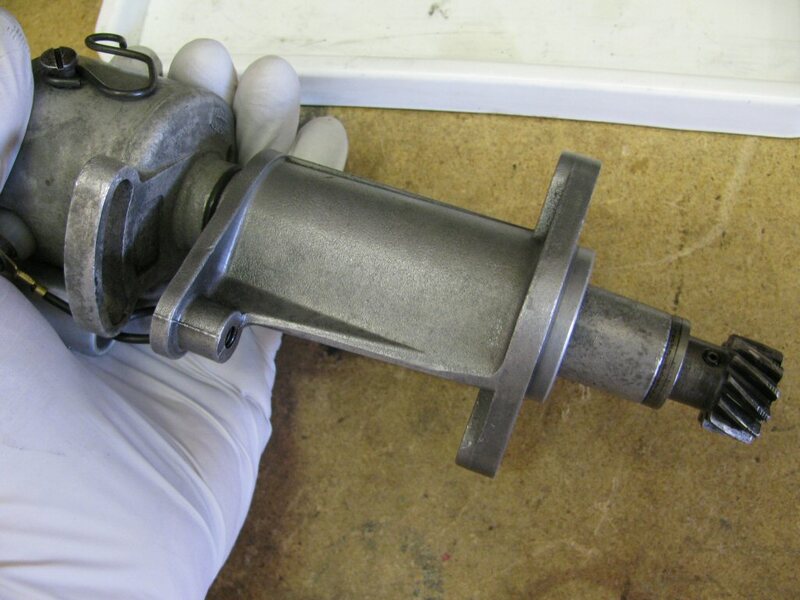 Fit the bolt and inner plastic insulation piece through the side of the distributor body. 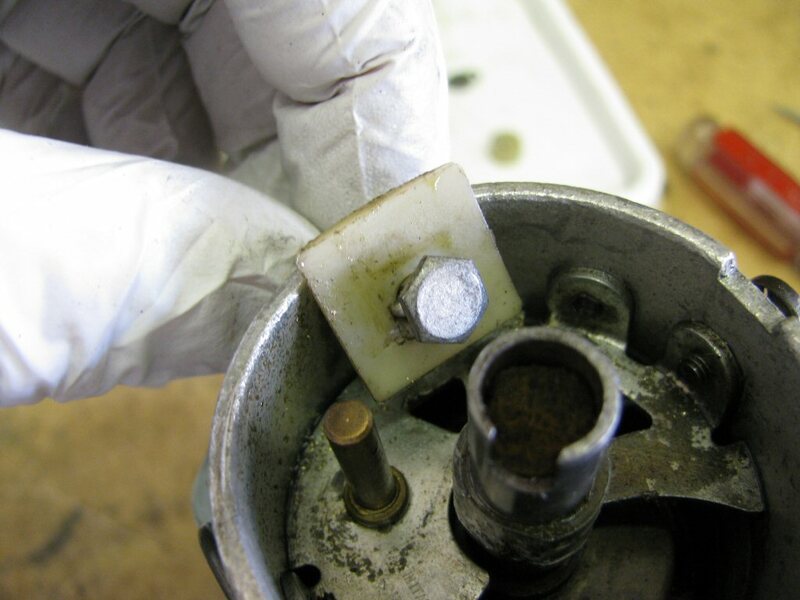 Note how the plastic insulation fits as well as how the bolt fits through the plastic insulation. Fit the outer plastic insulation piece. Again, note the keyed fitment with the bolt. 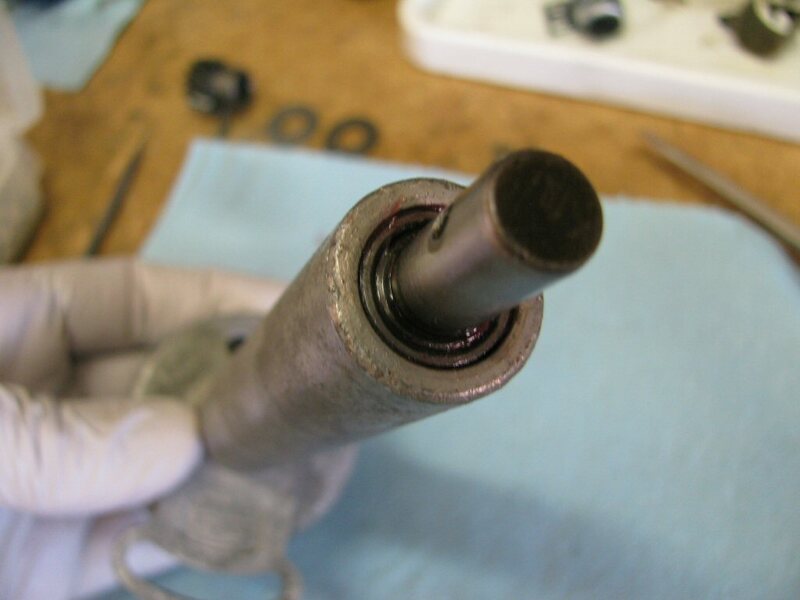 Fit the base of the contact breaker as shown. Fit the screw in place. 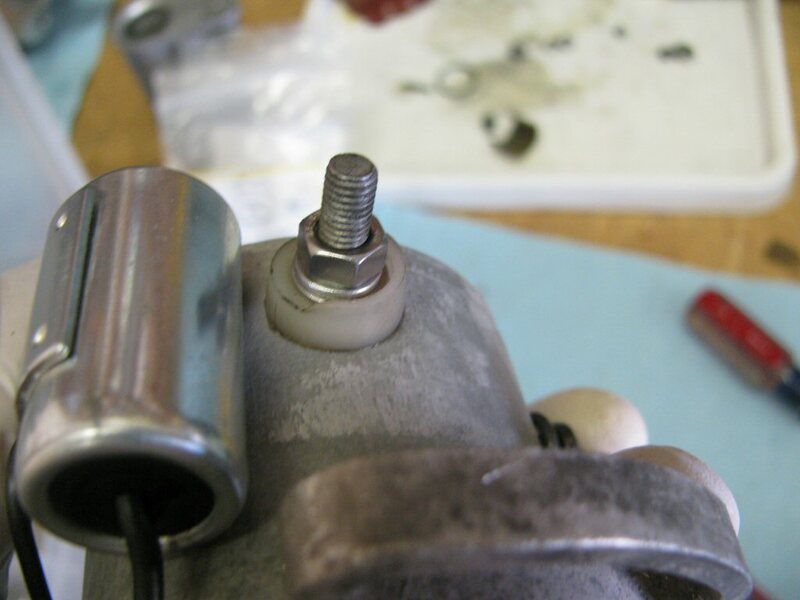 I like to use both a flat washer and a lock washer under the head of the screw. 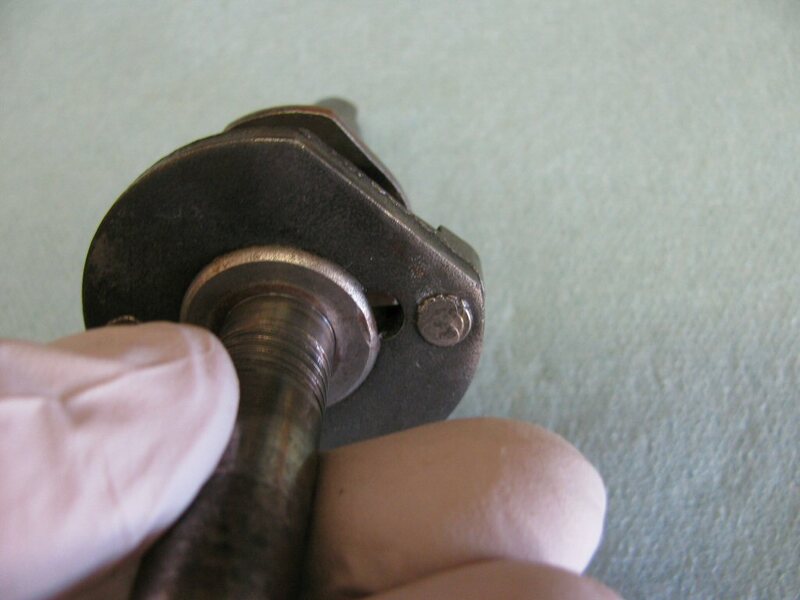 Fit the arm of the contact breaker as shown. 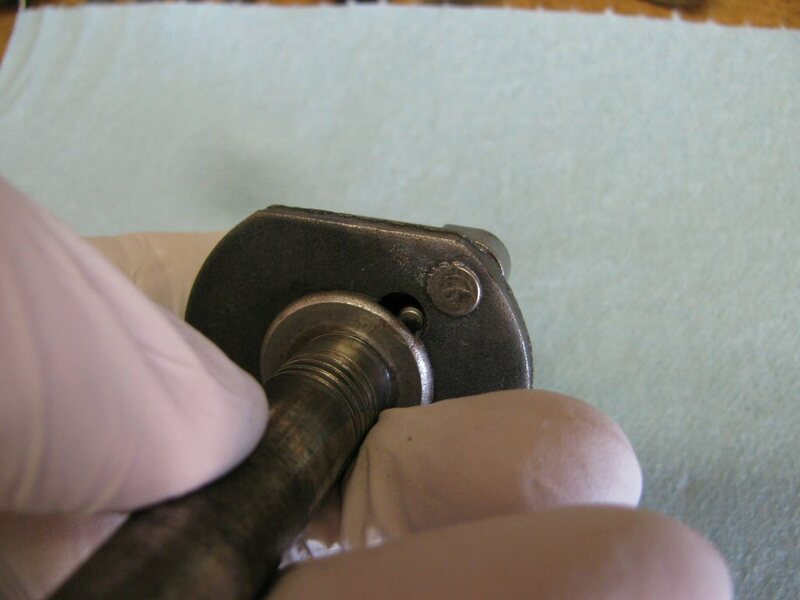 Note how the metal tab fits under the head of the bolt. 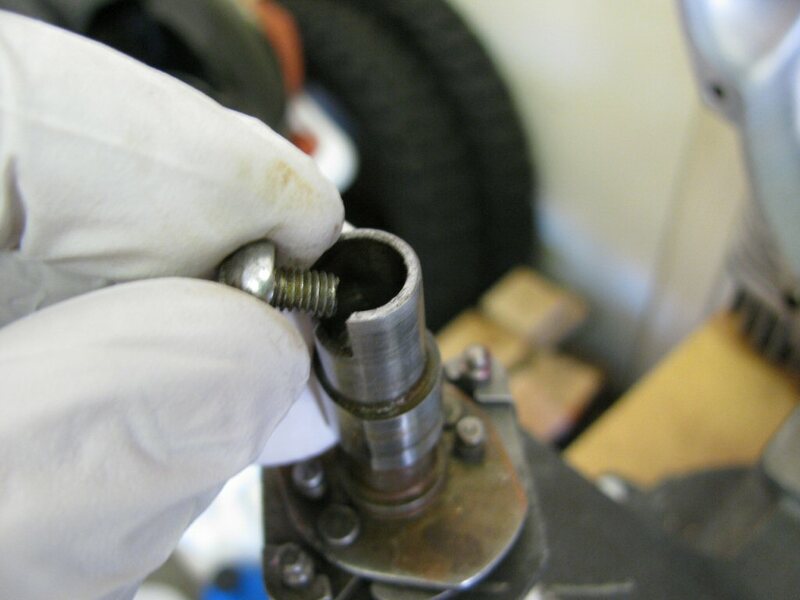 Fit and tighten the nut. 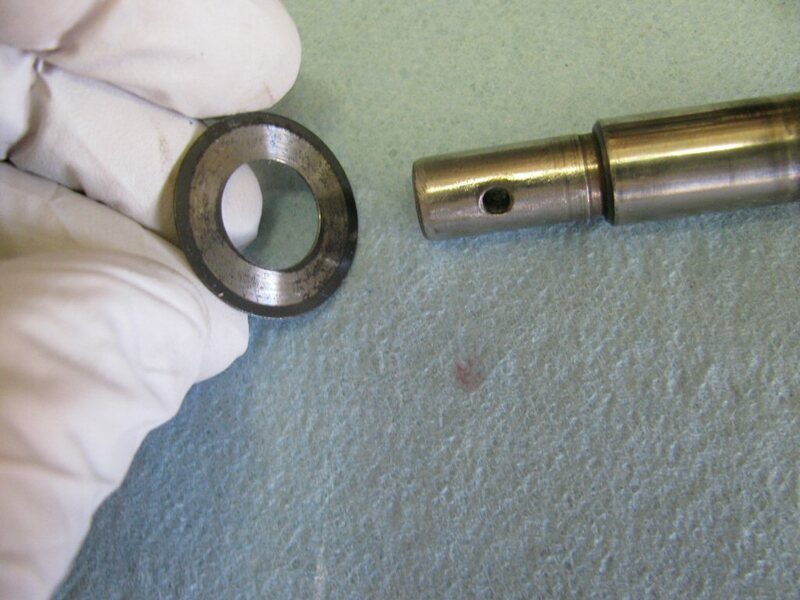 I use both a flat washer and a lock washer under the nut. 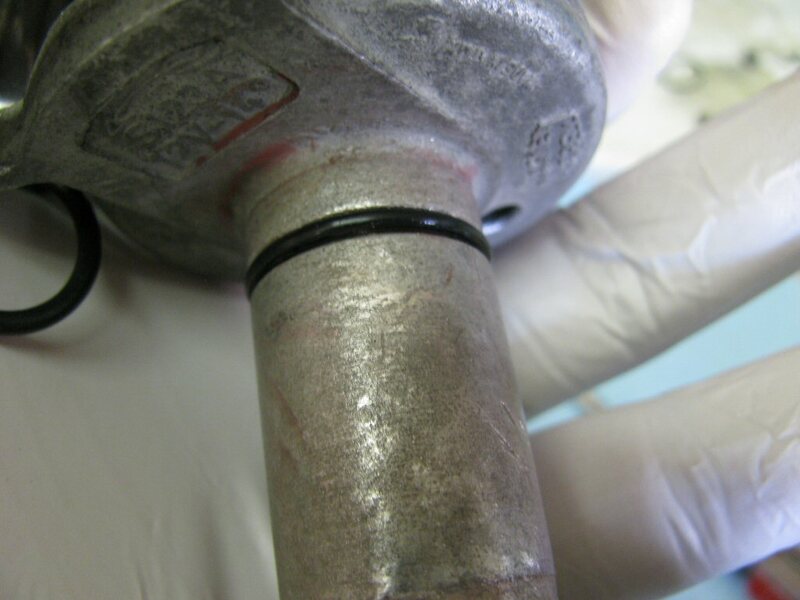 Tighten securely, but do not over tighten and break or deform the plastic insulation. 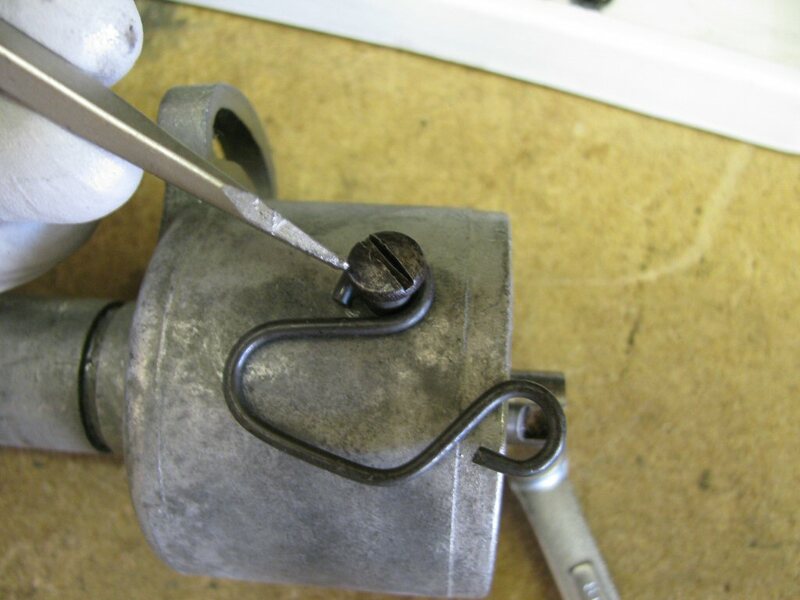 Fit the wire from the condenser and then secure in place with a flat washer, lock washer, and nut. Fit a new O-ring to the distributor body. 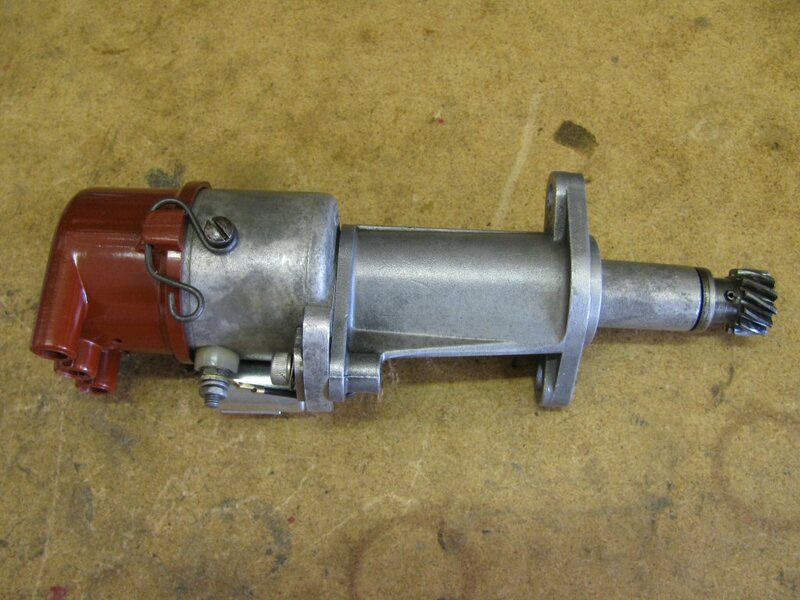 Slide the distributor base onto the distributor body. 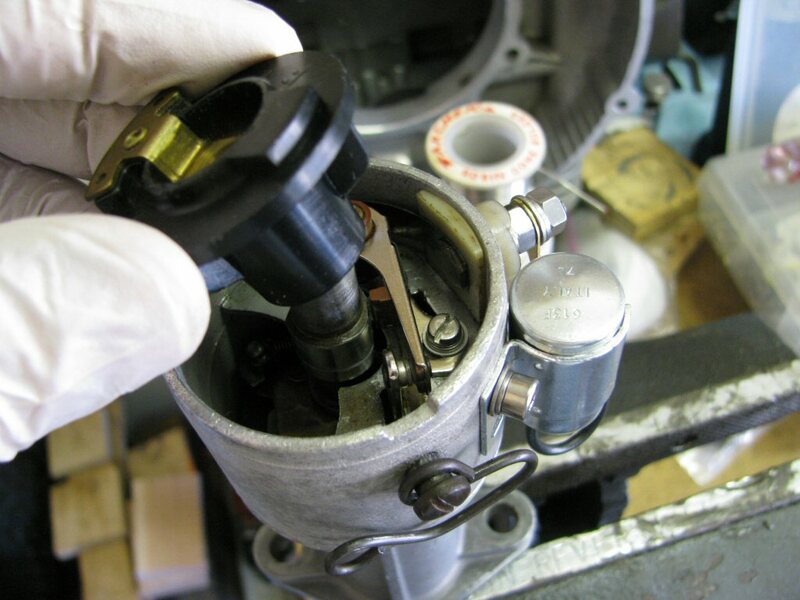 Secure the distributor body to the distributor base with the bolt and washer as shown. 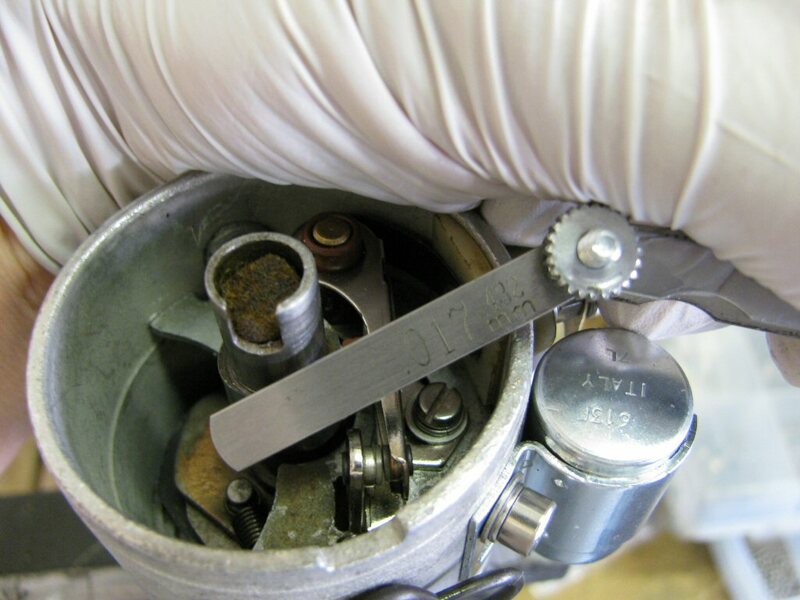 Again, a special washer was fabricated to spread out the forces on the soft aluminum of the distributor body. A very worthwhile upgrade. Adjust the clearance between the breaker points. 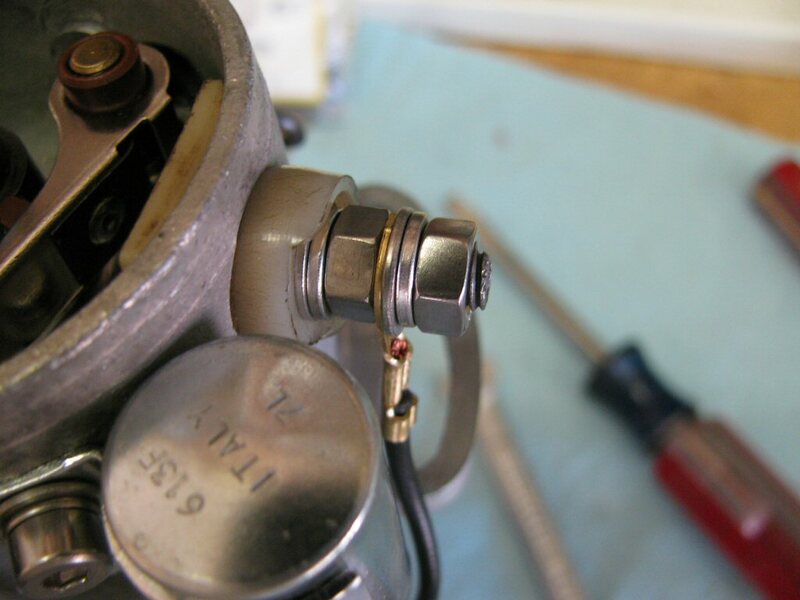 I place the breaker points on the wide lobe and set to 0.017 inch of clearance. 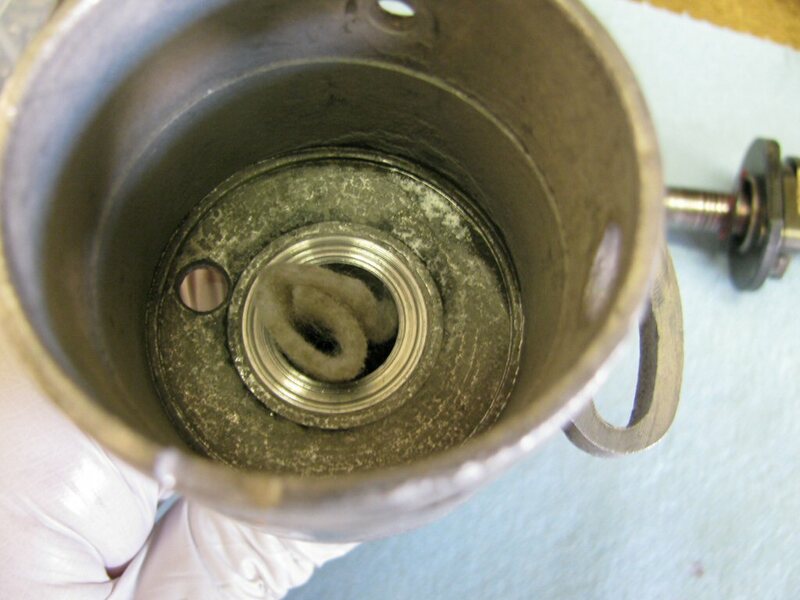 Lubricate the lobes with dielectric grease. 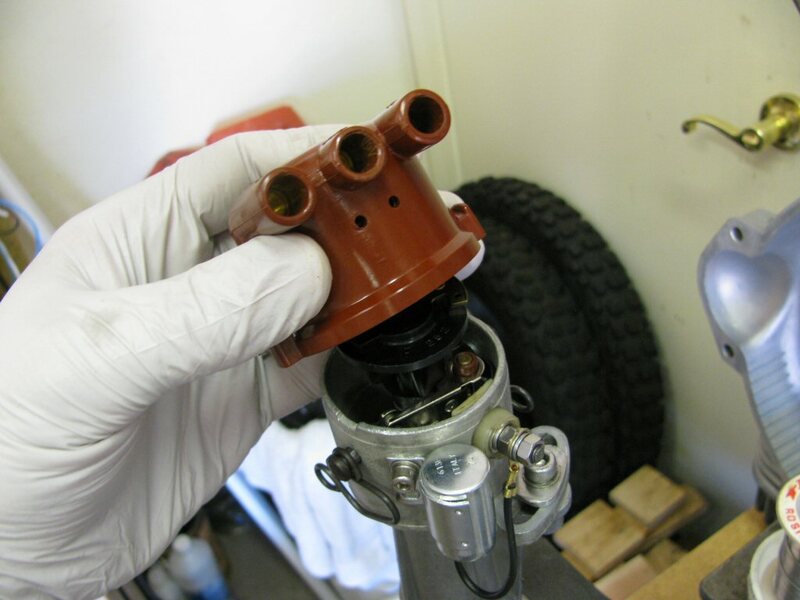 Fit the distributor cap. 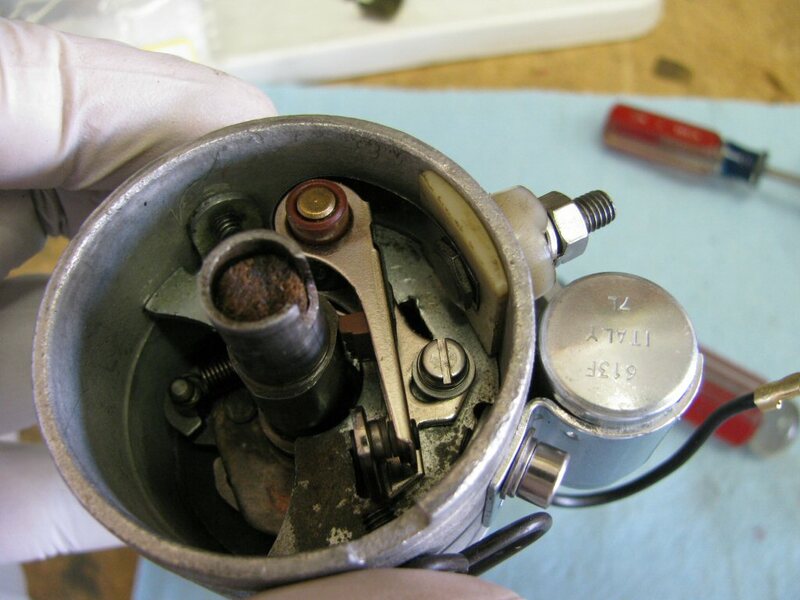 Note that the bottom of the distributor cap is notched to fit into a corresponding notch in the body of the distributor. 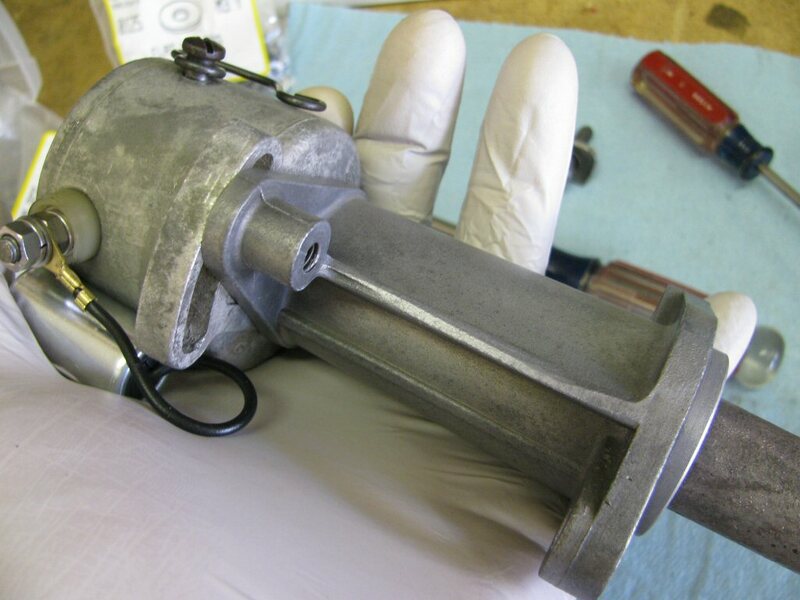 Rebuilt distributor ready to install.